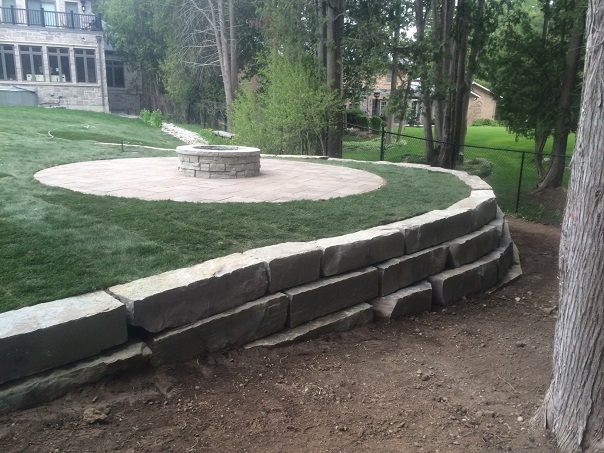 Stone Works is our greatest strength. 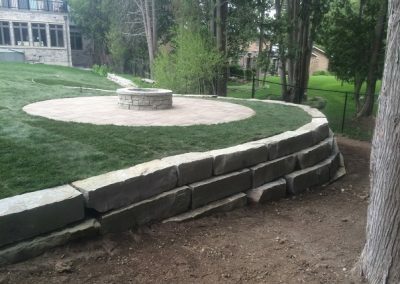 A well-placed stone can be a gorgeous decoration in a garden, while a stone patio with a built in fireplace can be nice place to enjoy a warm summer evening. 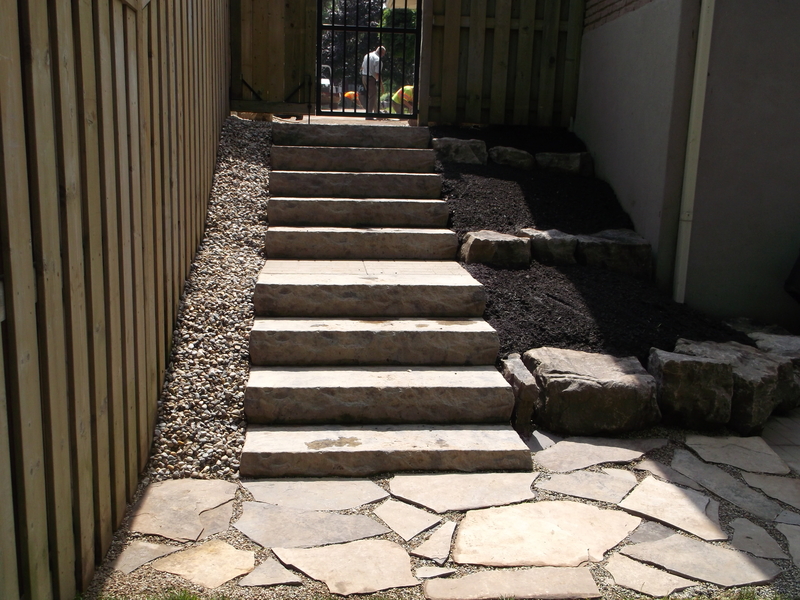 A garden with stone edging can really make the plants and gardens pop and stand out from the rest of the property. 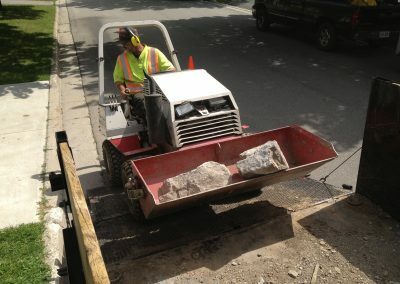 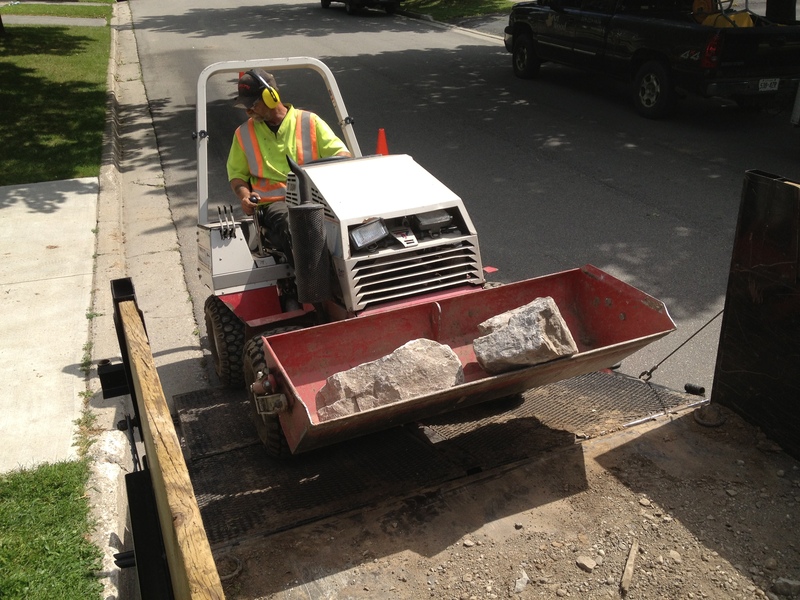 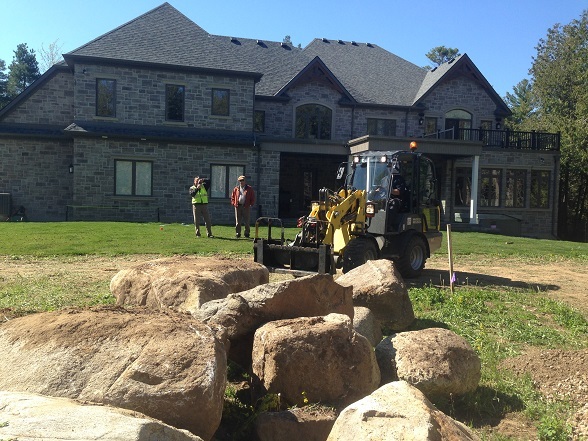 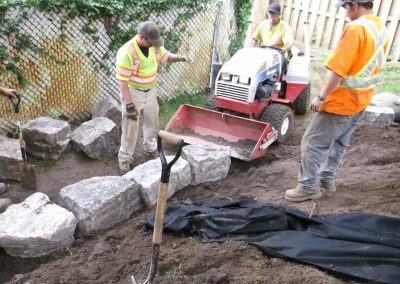 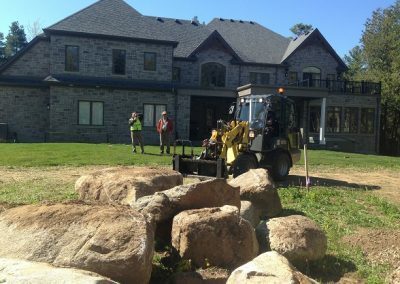 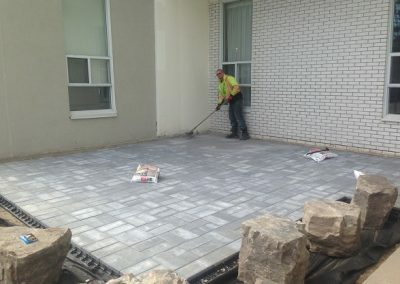 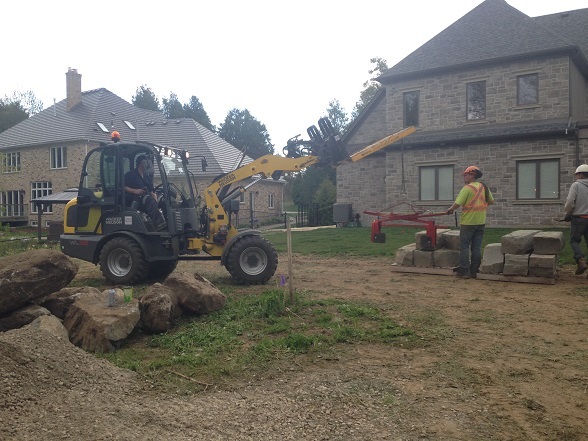 At Art Wood Enterprises, with our professional team and our vast repertoire of equipment, we can handle any size stone. 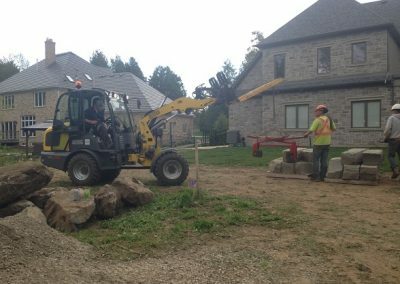 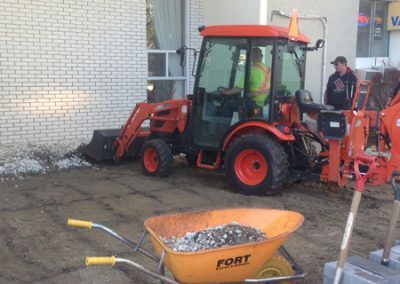 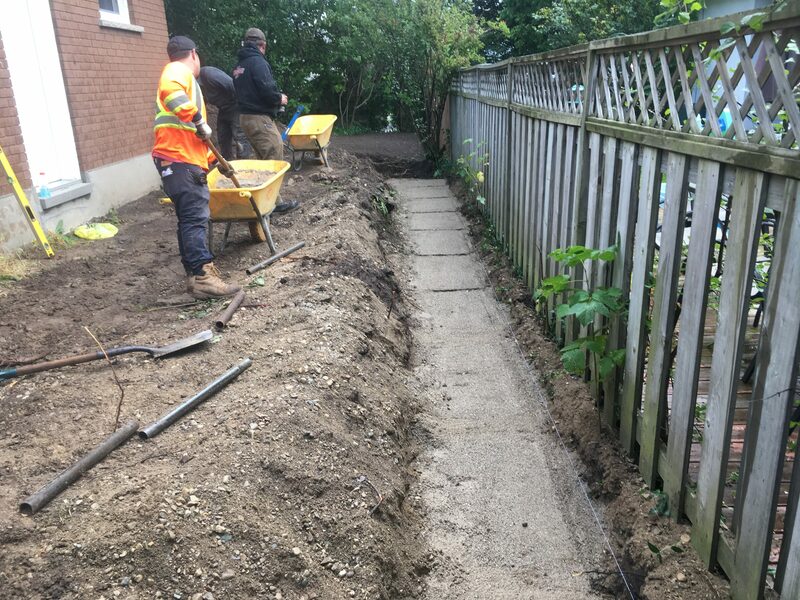 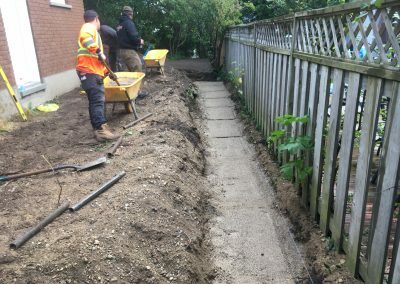 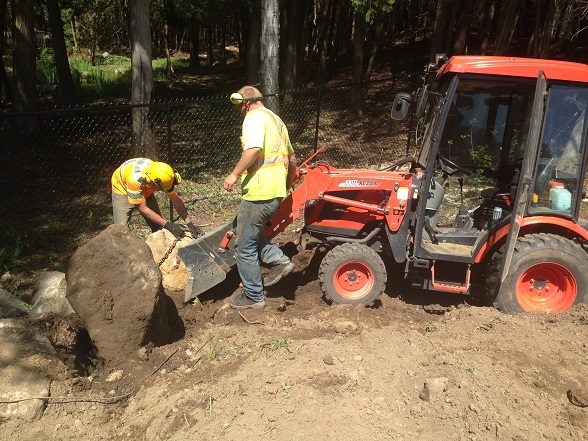 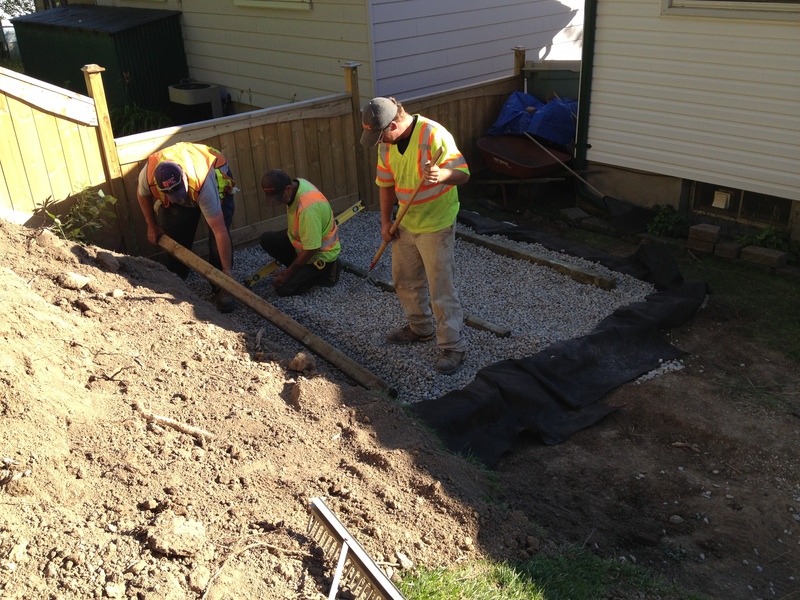 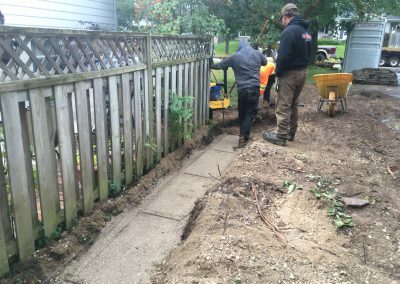 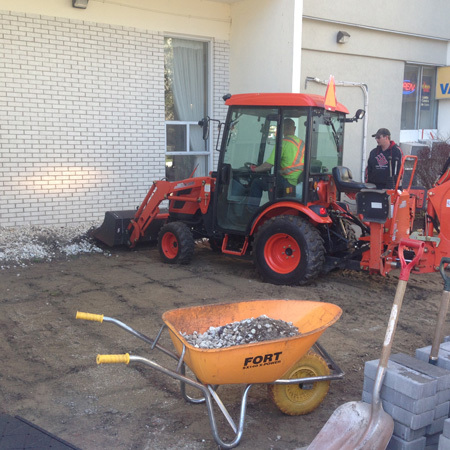 Whether you are looking for just some gravel, or for a full stone retaining wall, call Art Wood Enterprises today! 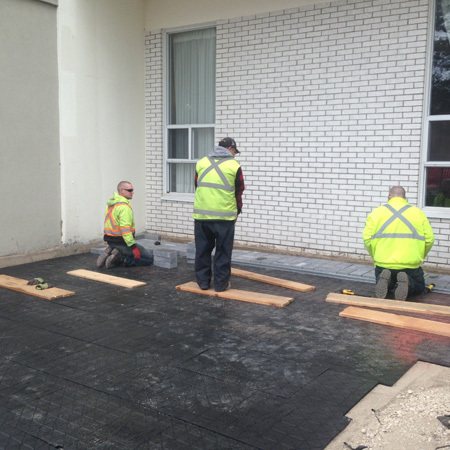 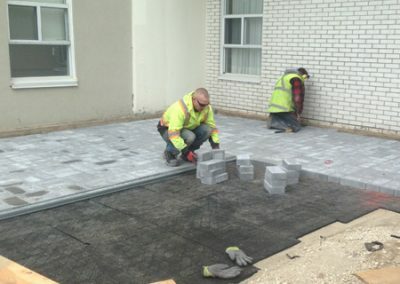 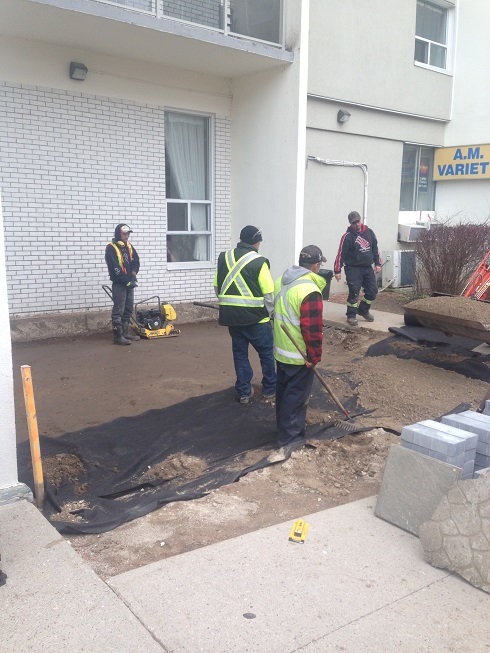 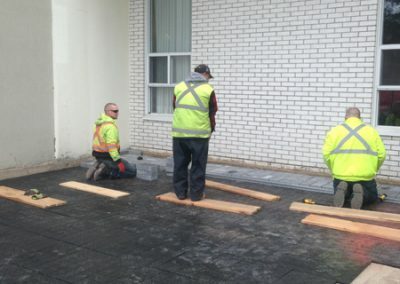 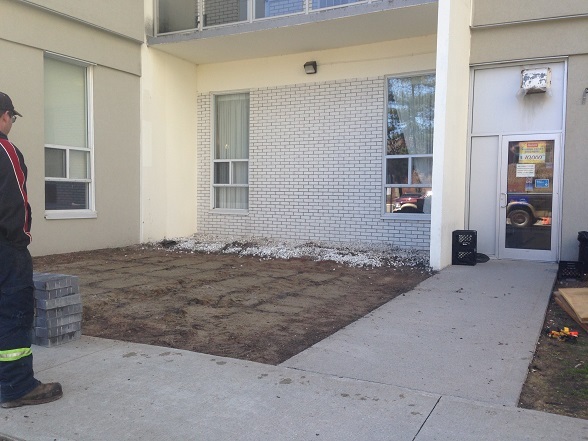 In a commercial setting high curb appeal invites new business. 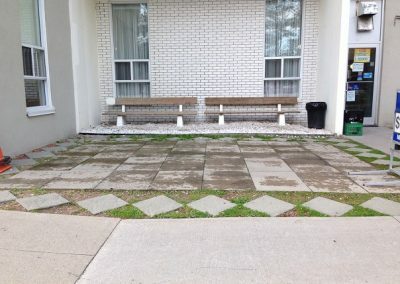 This store front was in desperate need of some help. The seating area was starting to warp, and while it was functional there was little to no curb appeal. 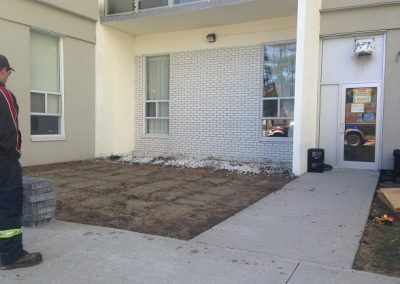 We removed all the existing elements and started fresh. 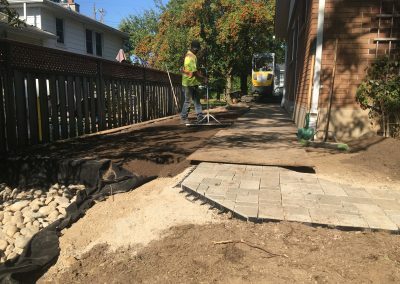 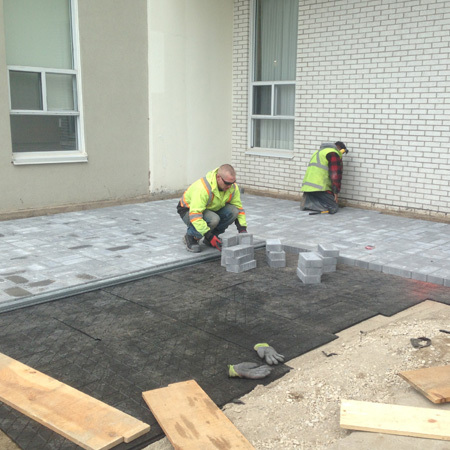 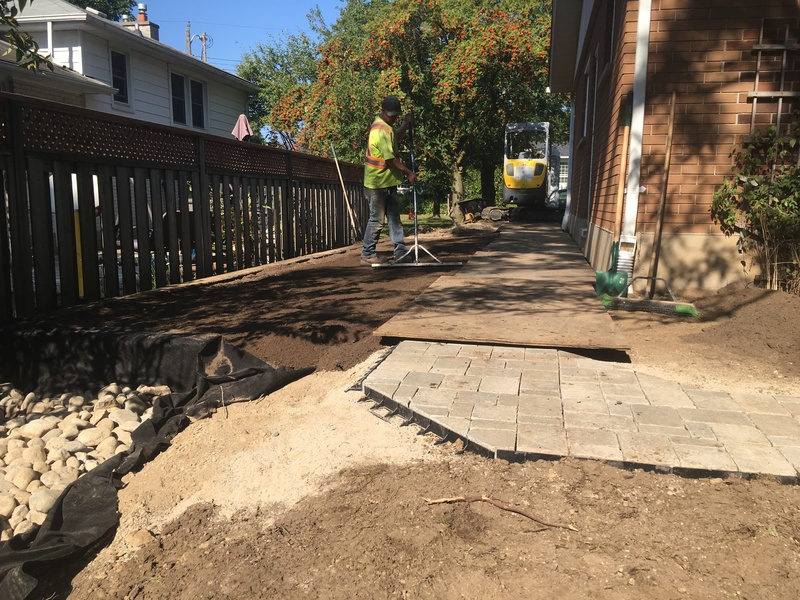 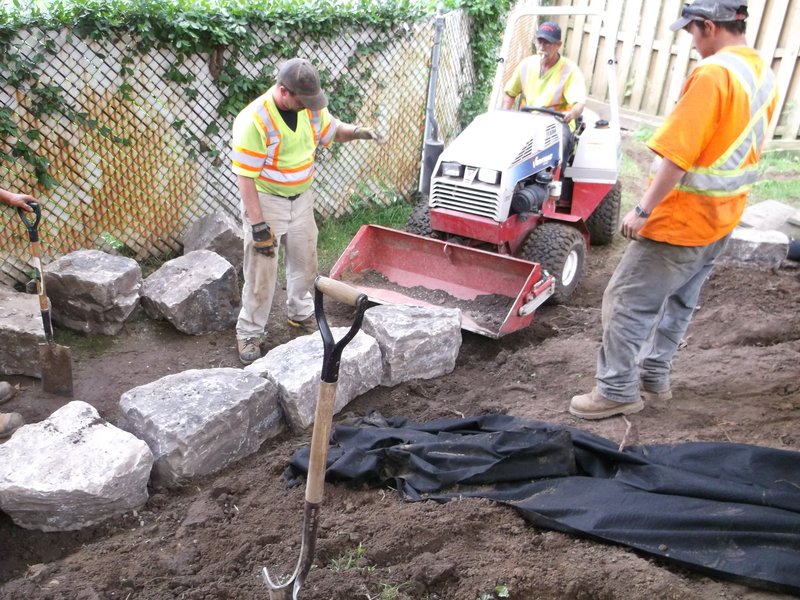 We leveled and regraded the area before creating an appropriate base and installing new interlocking stone. 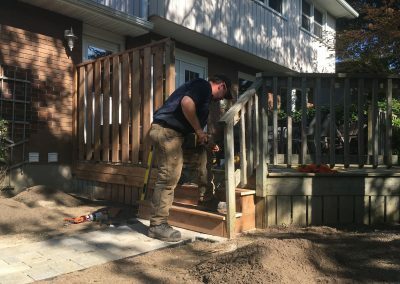 We created new flower beds as a border and built custom raised wooden planters to sit in the middle and corners of the patio. 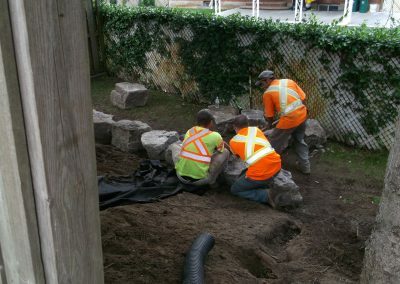 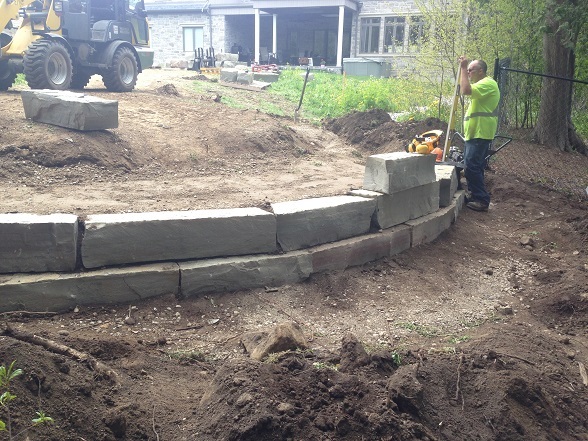 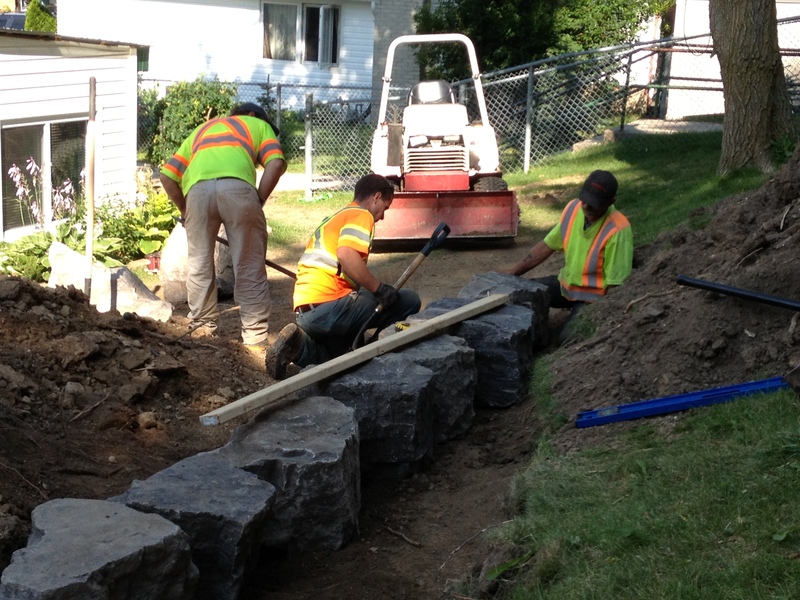 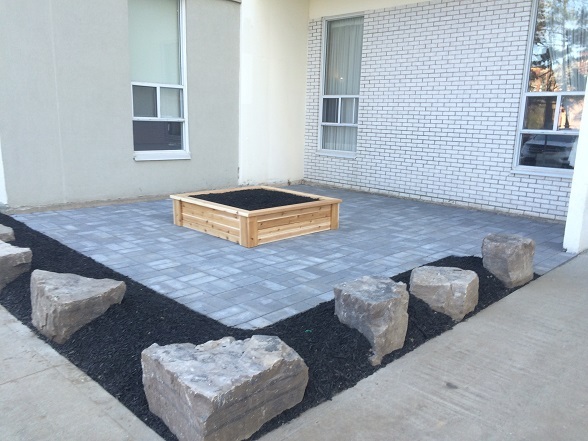 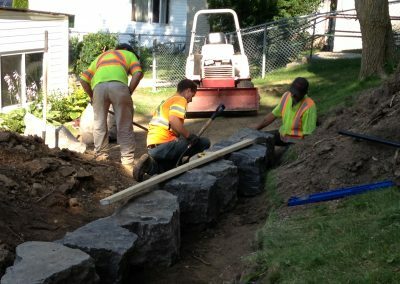 We installed armour stone as feature rocks into the garden, and new benches to the seating area. 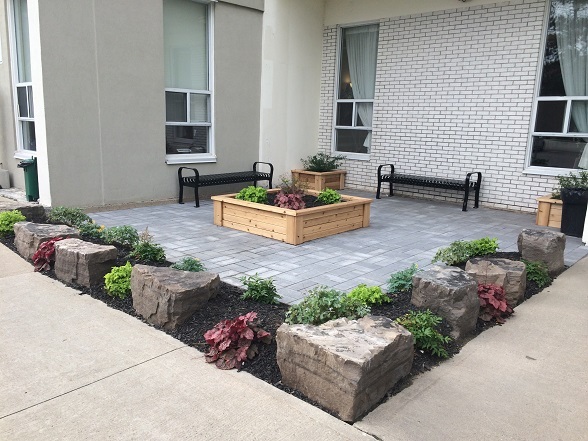 Finally, we installed a black mulch, and a colourful assortment of perennials plants, to add a nice pop of colour. This client had a large backyard that was only partially useable. 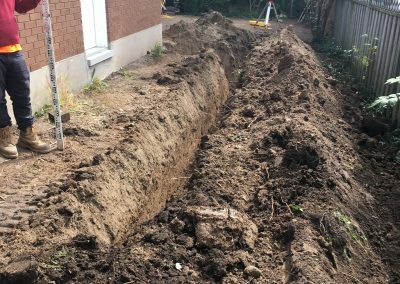 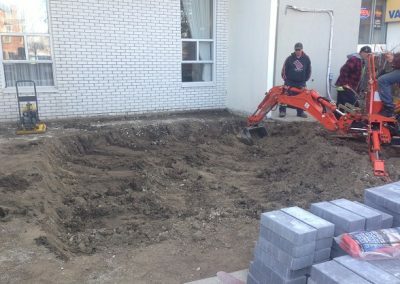 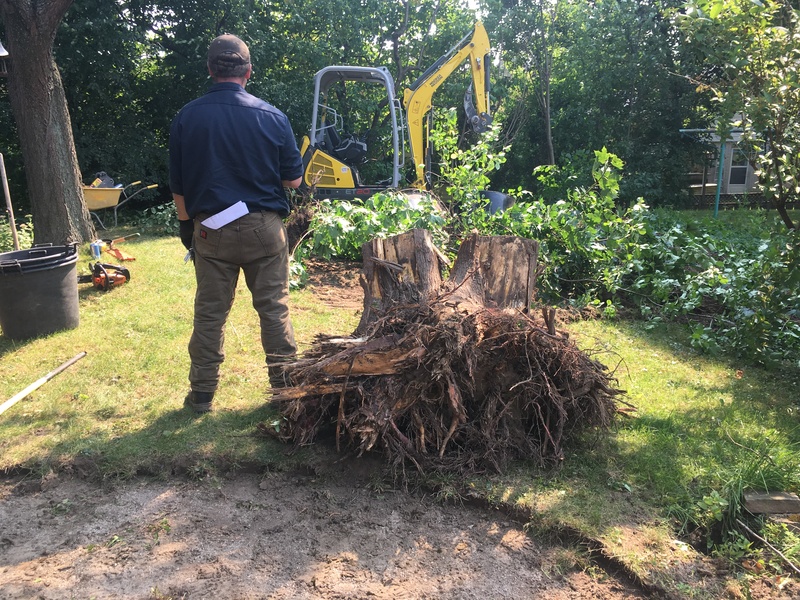 The back half of the property had a slope that was constantly saturated in water to the point of being unmaintainable without losing equipment in the mud. 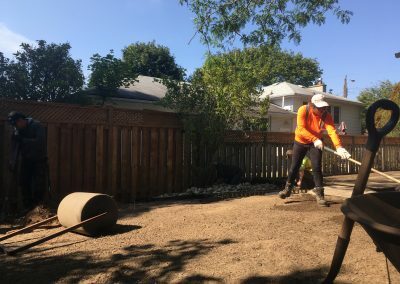 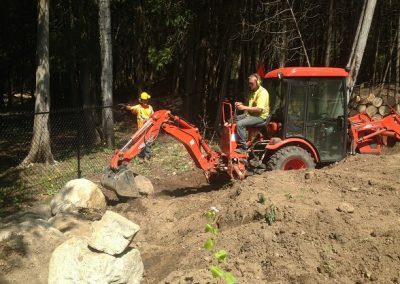 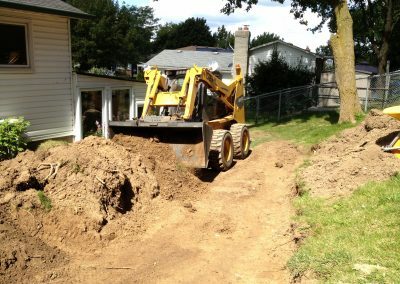 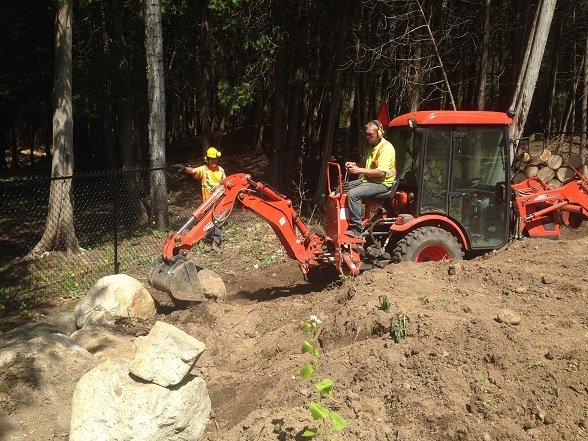 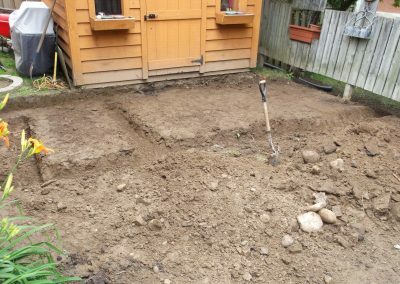 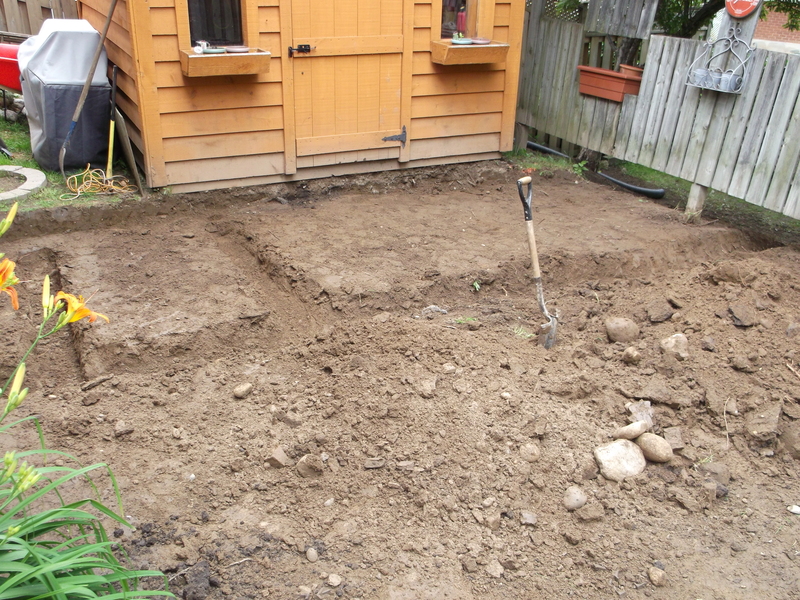 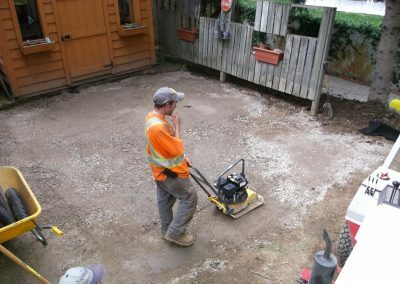 We levelled and regraded the backyard, removing most of the slope. 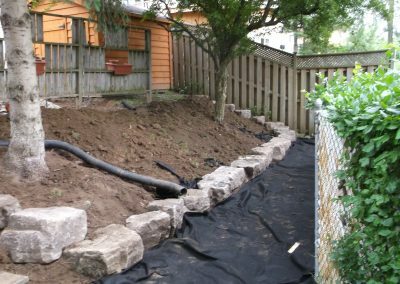 We added a French drain around the well and redirected the water to it. 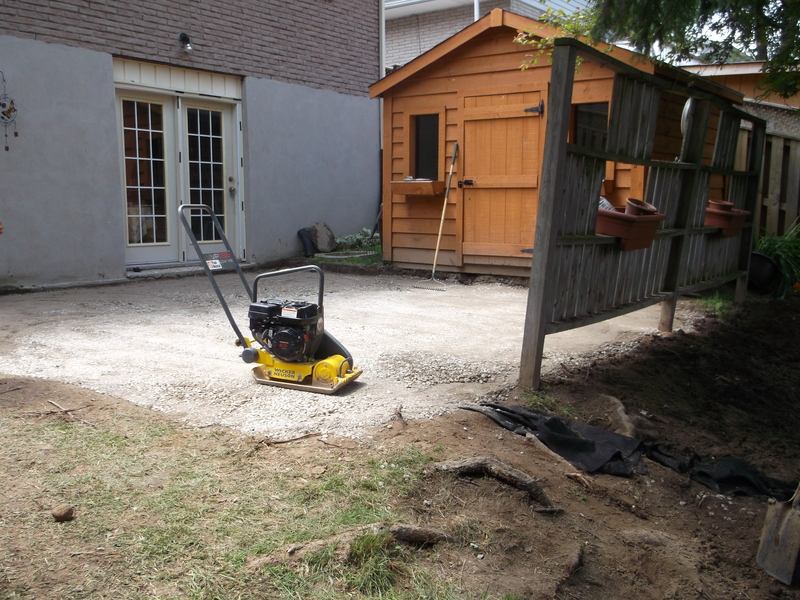 This dried up the back half of the property, creating a useable area. We created a stone retaining wall at the back corner of the property where grading the slope out was not feasible. 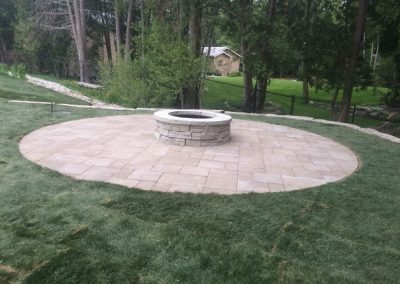 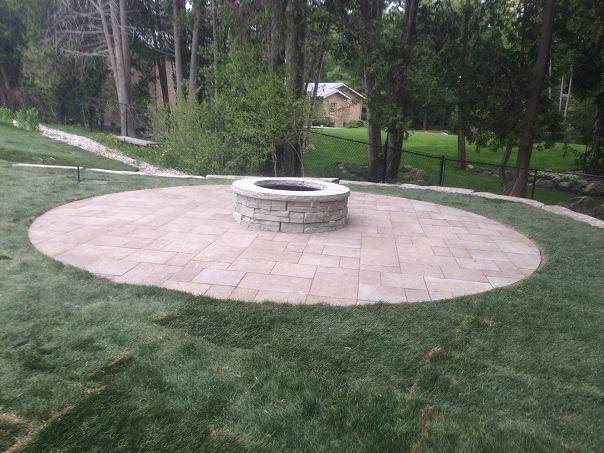 Along the top of the retaining wall we created an interlock pad with a stone fire pit. 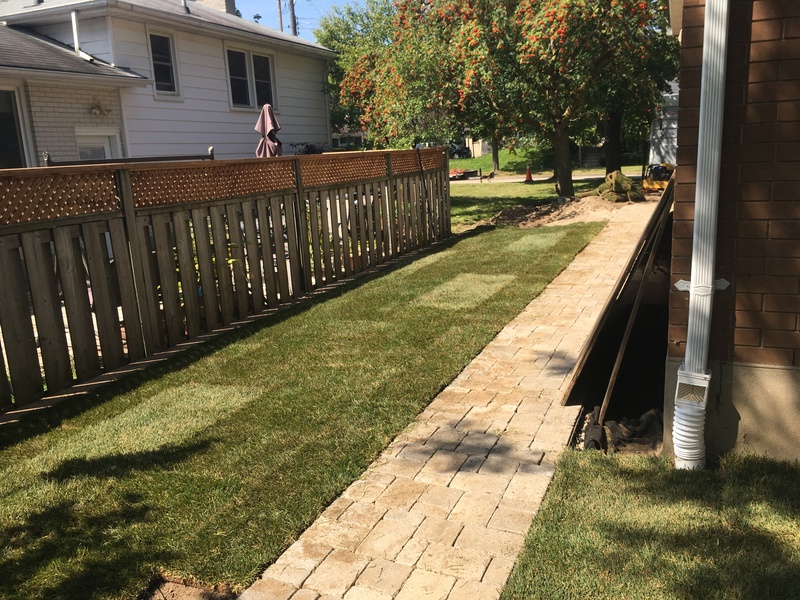 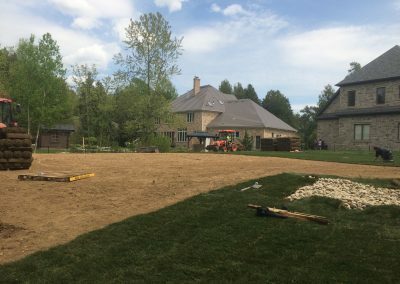 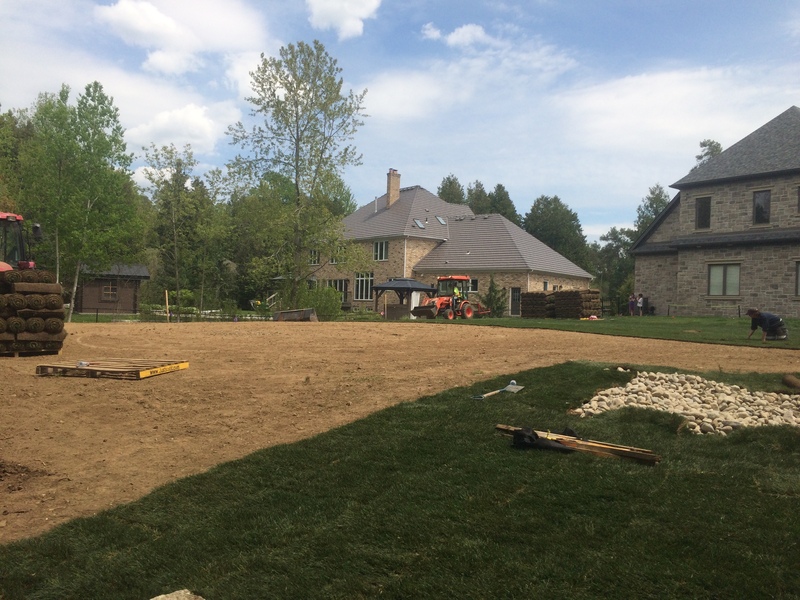 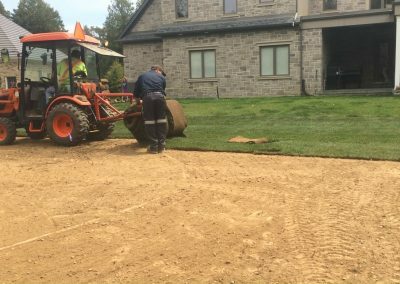 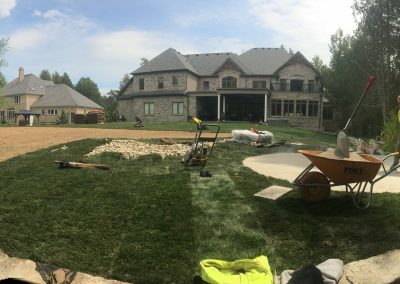 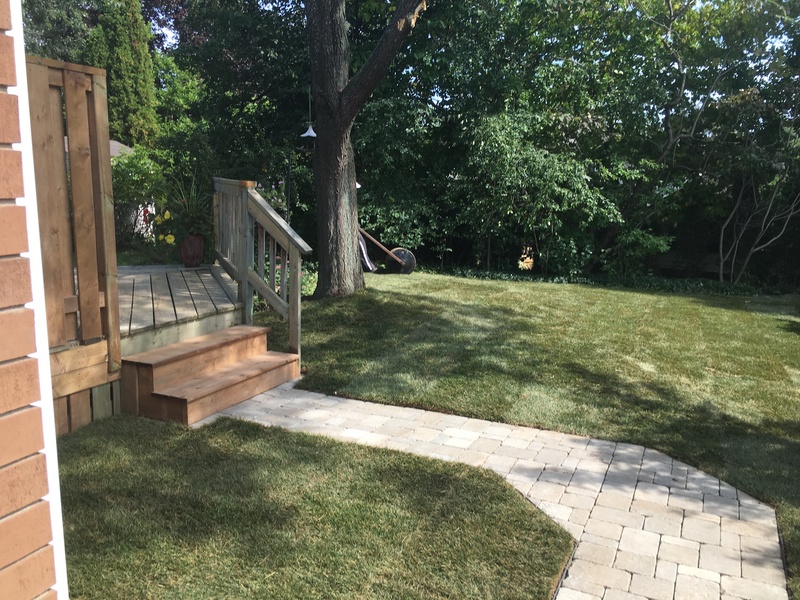 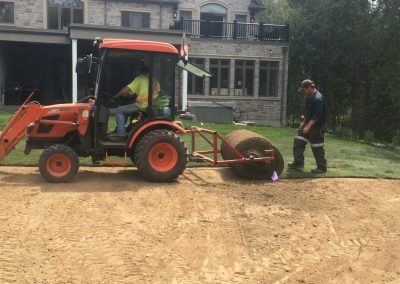 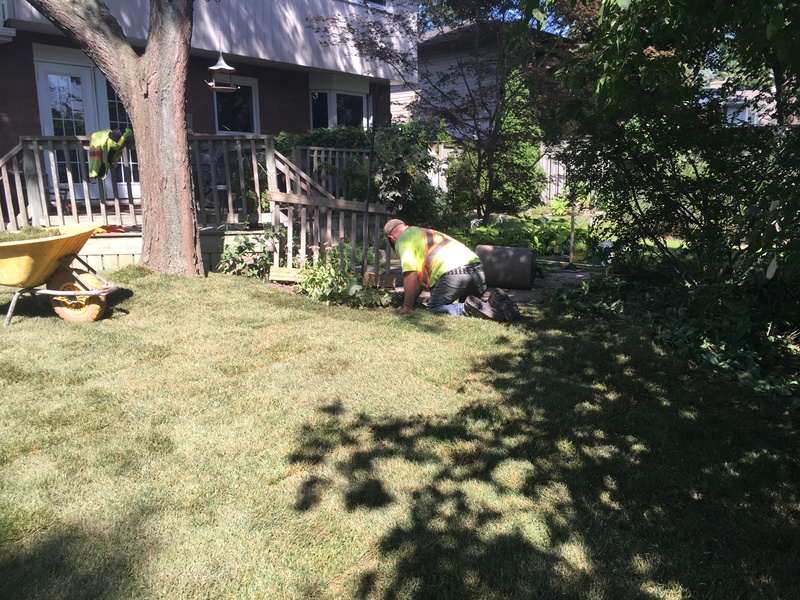 Due to the size of the property we were able to finish the backyard with large rolls of sod, minimizing visible seams during the critical rooting period. 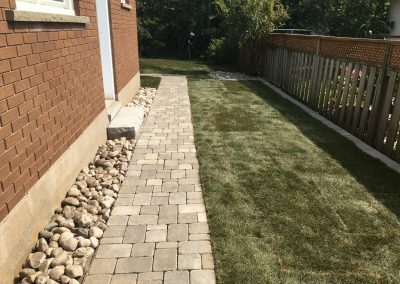 Turf on hillsides can often be difficult to maintain. 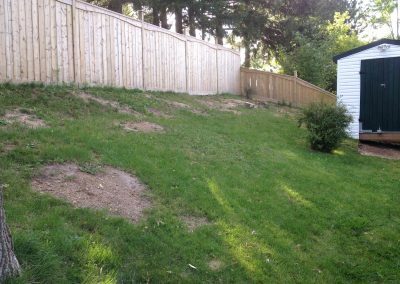 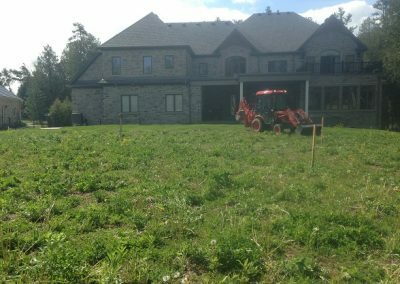 This client was finding that they were starting to struggle with the hillside and were constantly ending up with dead patches of grass. 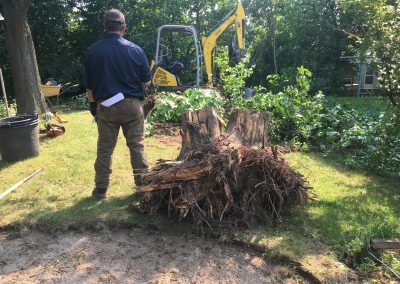 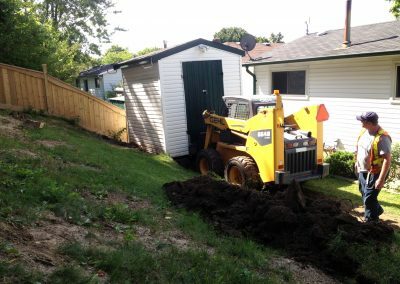 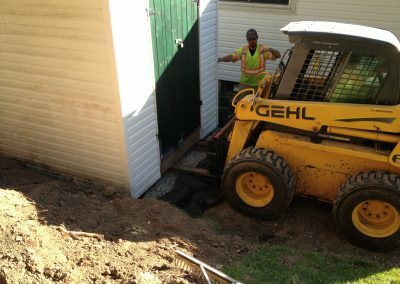 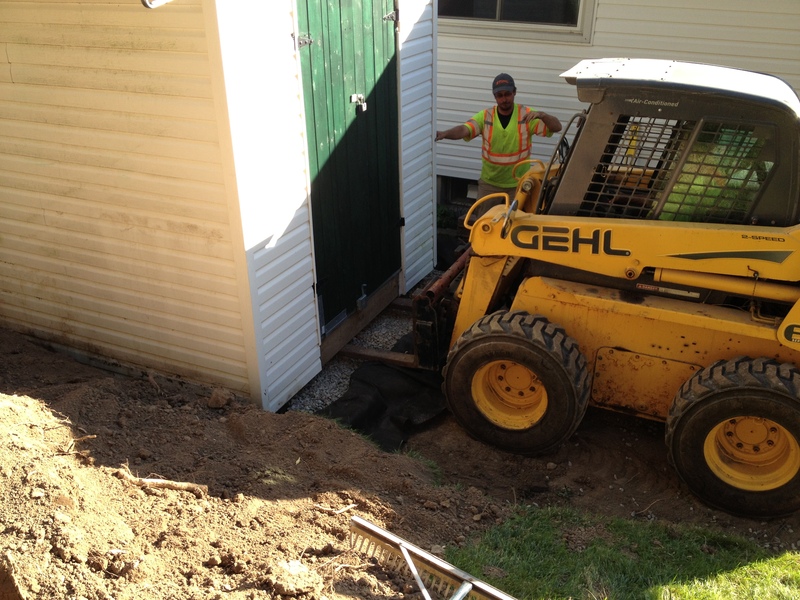 They were dealing with some erosion in the backyard and had a shed that was only partially flush with the ground. 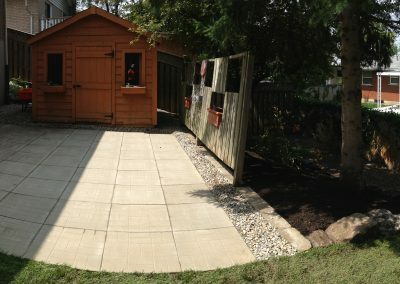 We came in and moved the shed out of the way, installed an appropriate base and put the shed back. 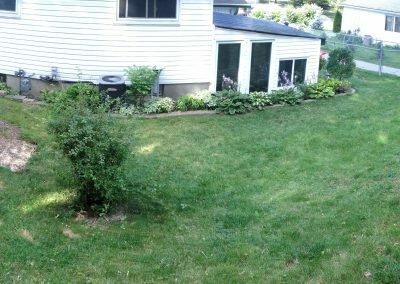 We removed all the turf in the backyard, and created a multi-tiered garden, which is much easier to maintain than a slope. 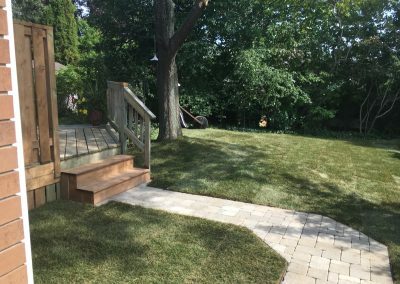 We installed new sod throughout the backyard. 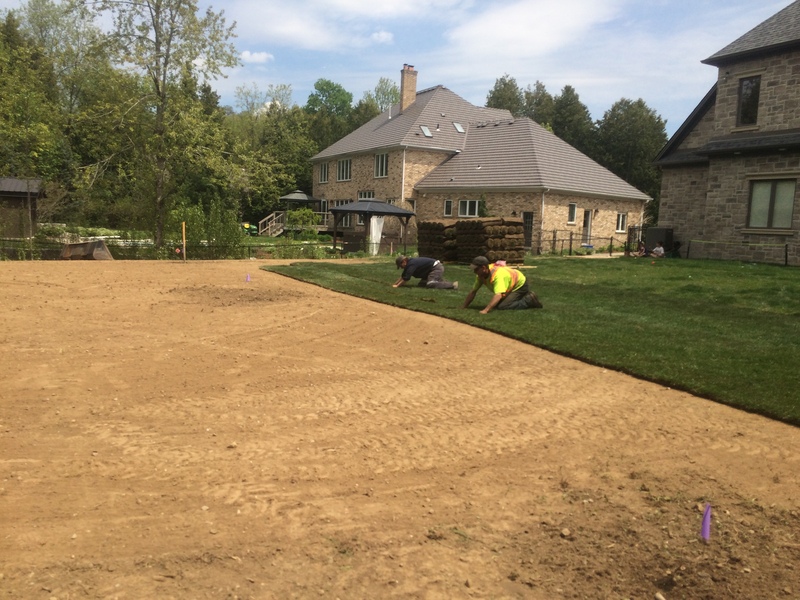 We ensured the garden was ready for planting, and the client opted to do their own. 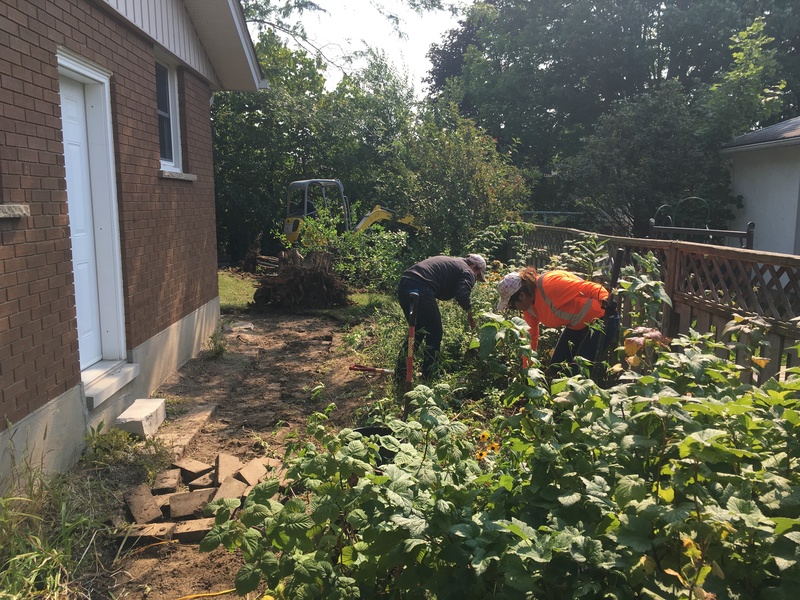 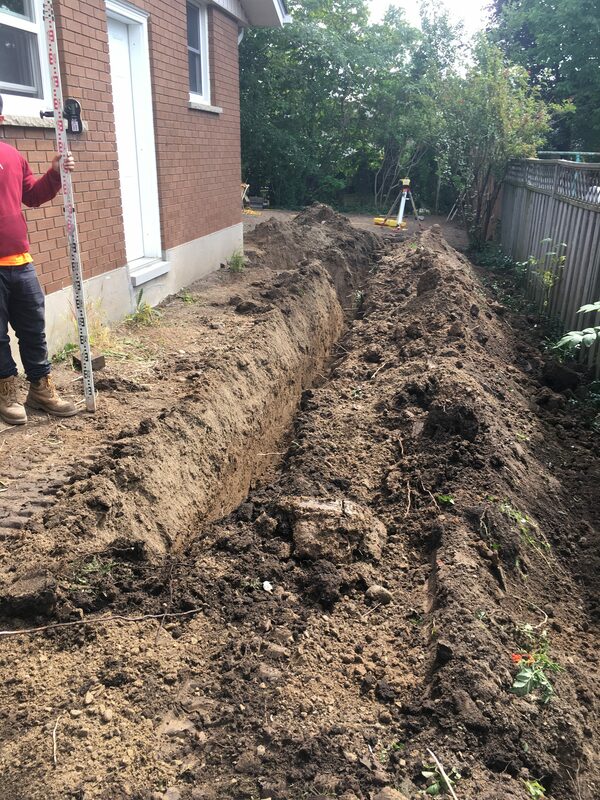 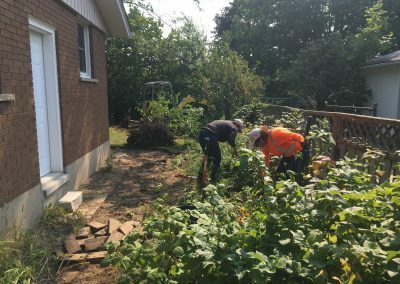 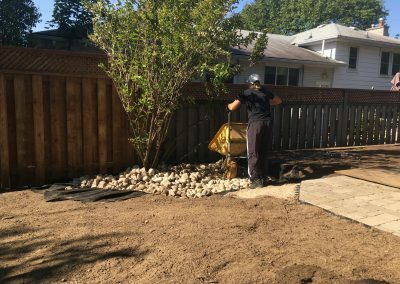 This client was dealing with a barely functioning backyard. 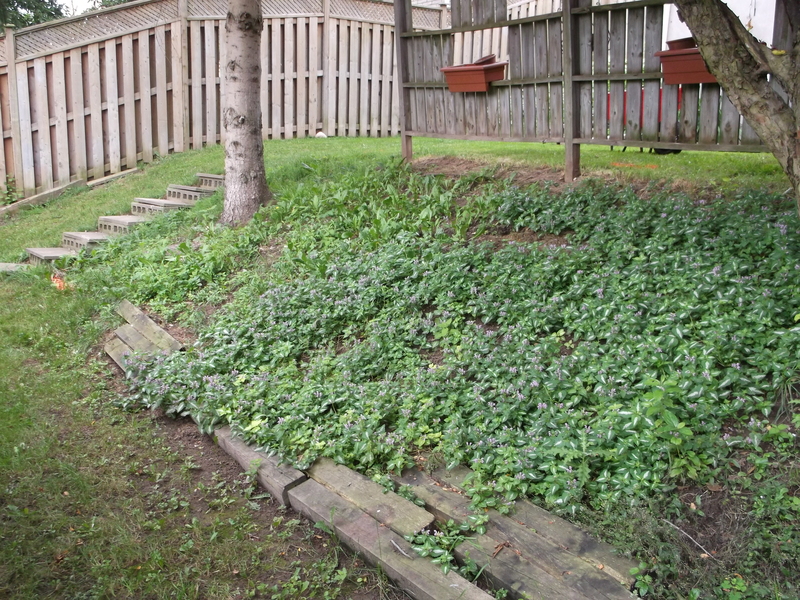 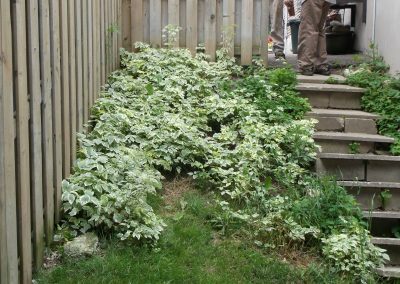 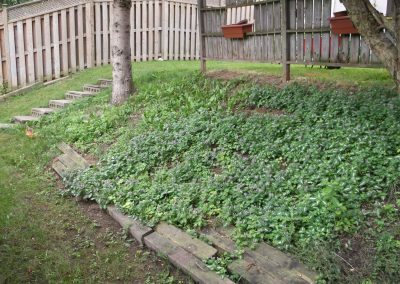 The stairs were starting to fall apart and were unsafe to use, there was little to no patio in the backyard, and the hillside gardens were completely taken over by ground covers. 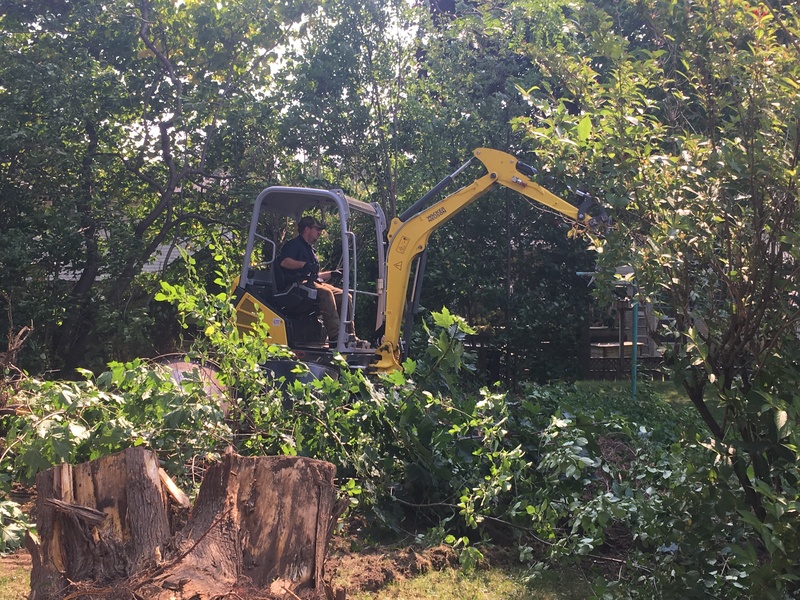 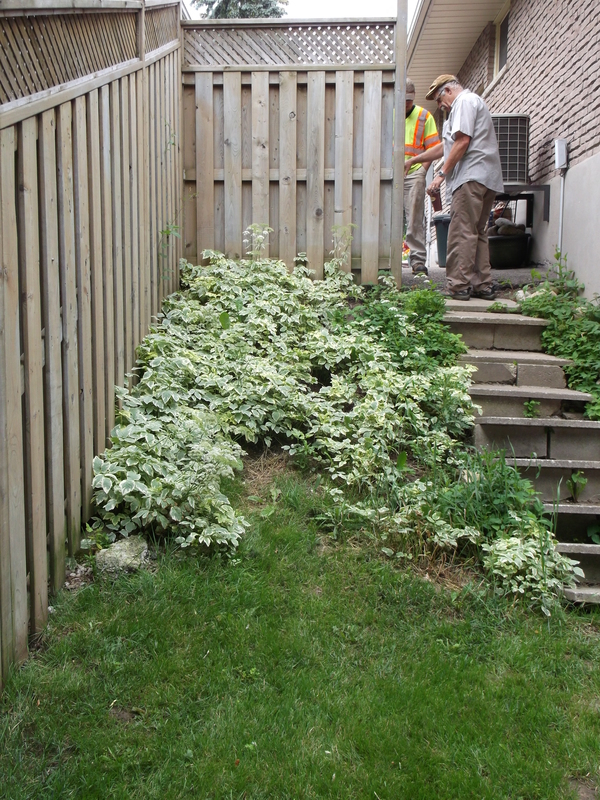 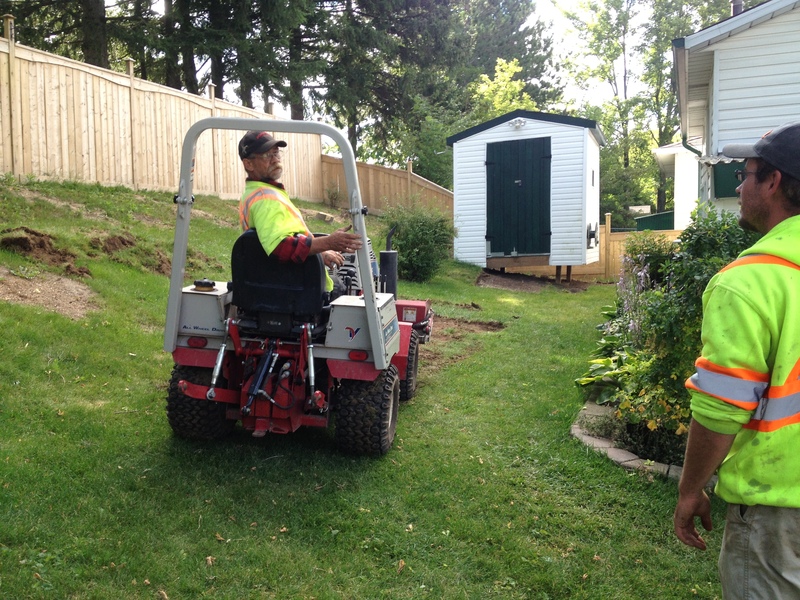 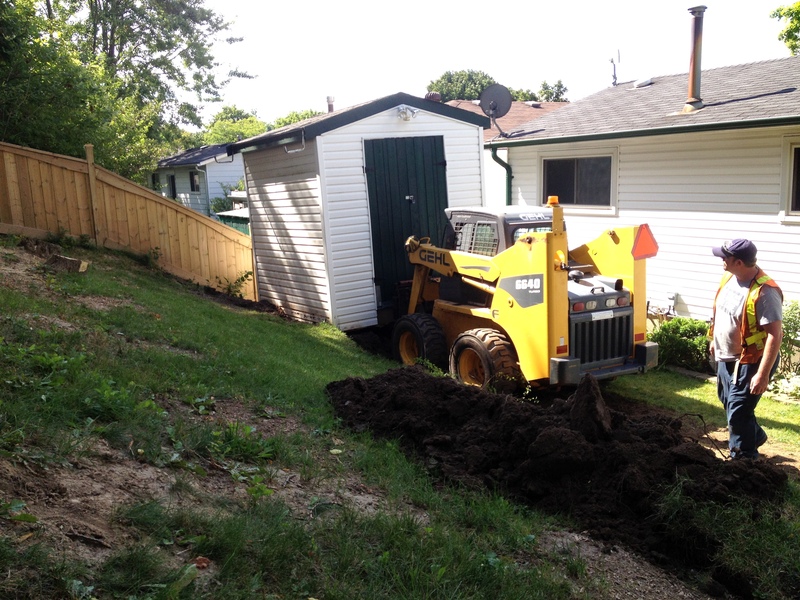 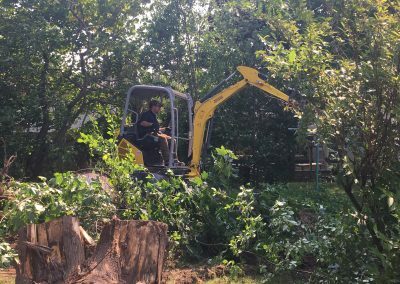 We removed most of the existing elements in the backyard, preserving the mature trees, privacy barrier and shed. 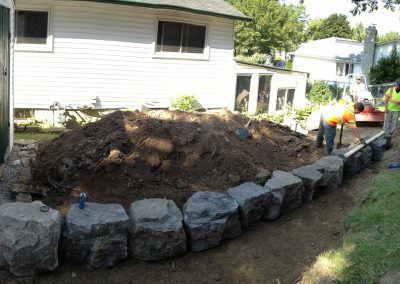 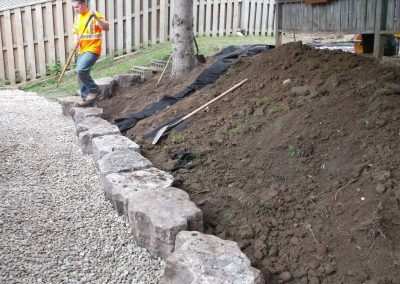 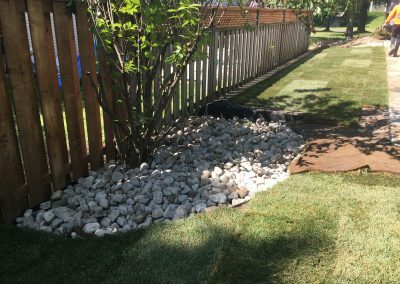 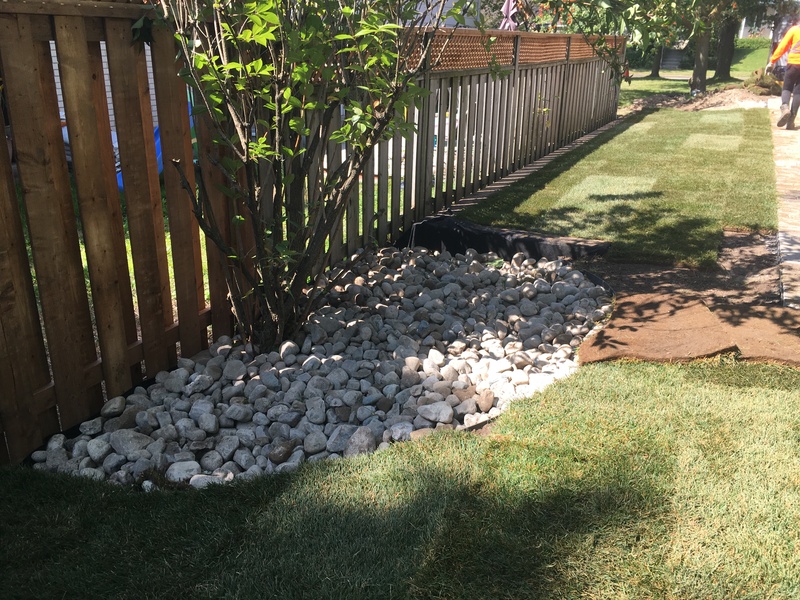 We installed armour stone along the bottom of the hillside to prevent erosion, and a pea stone diffusion bed to disperse the water in the back yard. 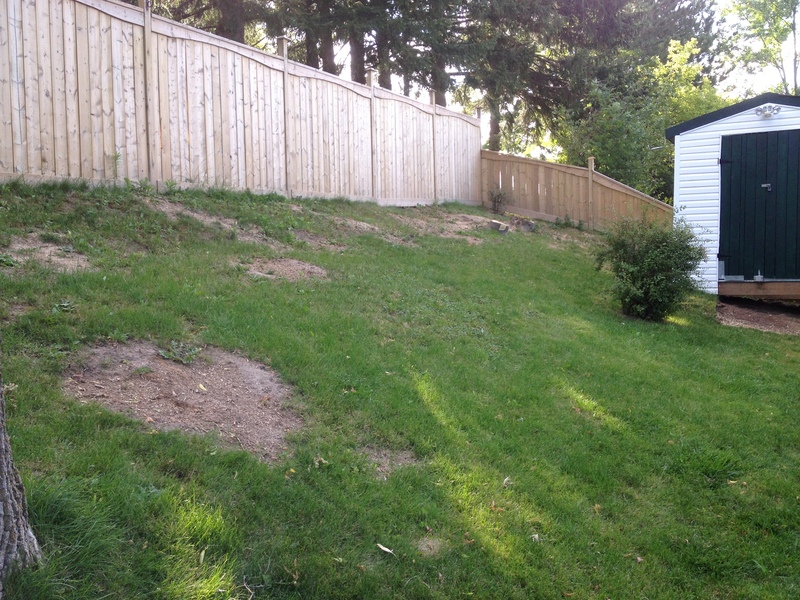 The lowest half of the backyard had a steep hill that was difficult to maintain and traverse. 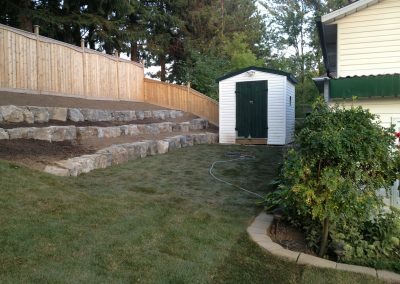 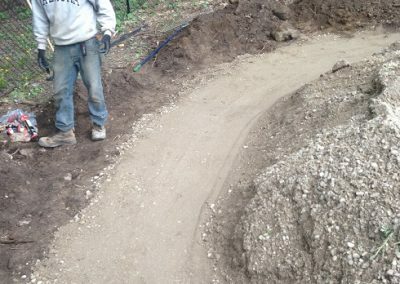 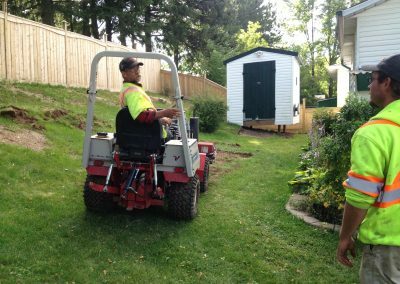 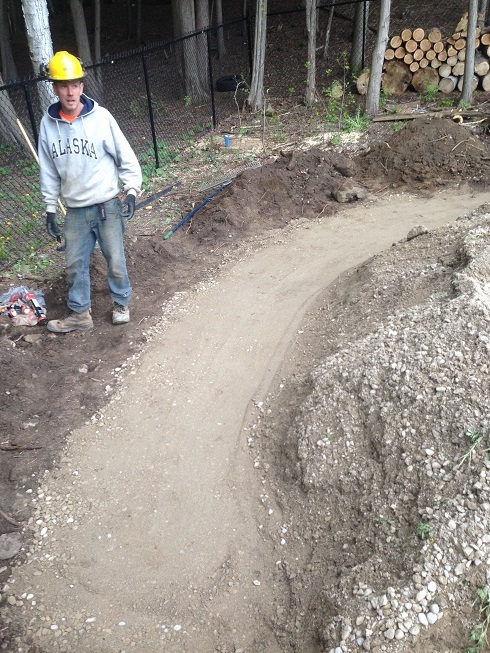 We regraded the hill to create a more gradual slope, providing easier access to the lower half of the backyard. Next, we installed an appropriate base and created a patio for the client, ensuring the privacy screen was being maximized. 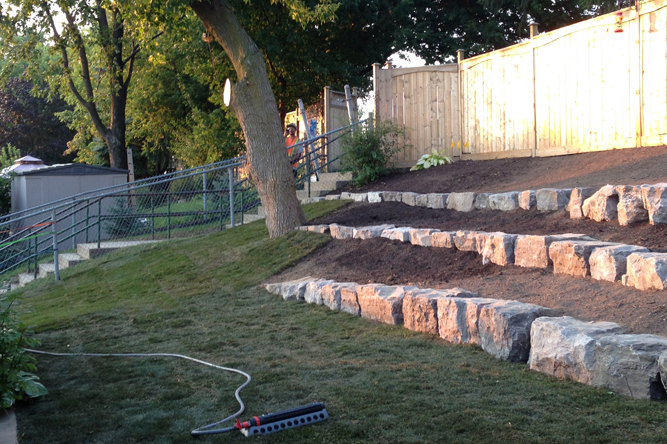 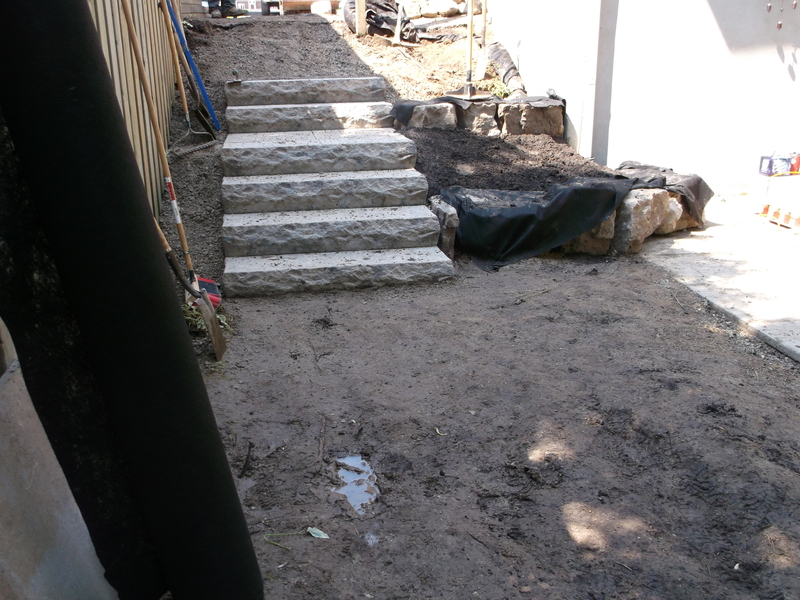 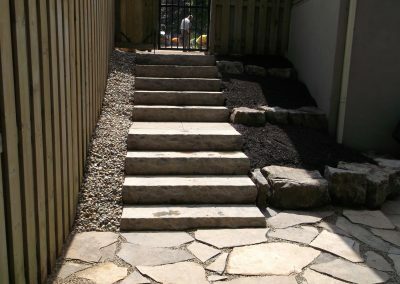 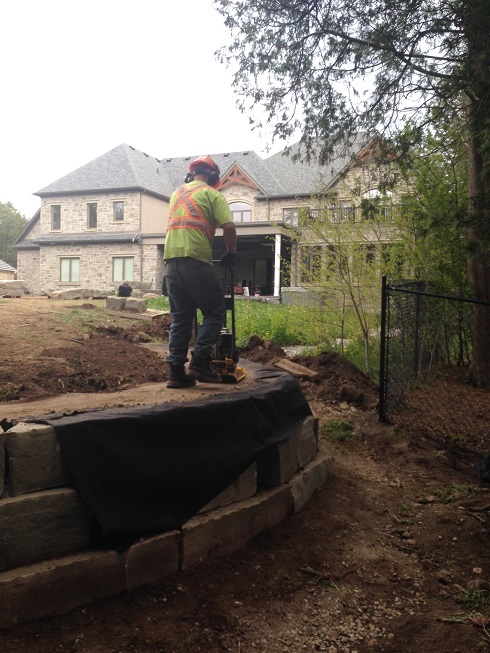 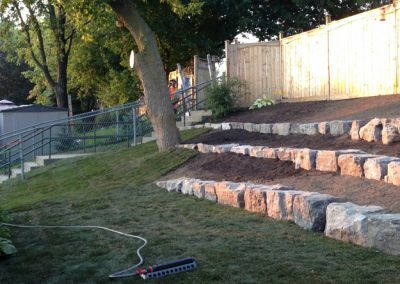 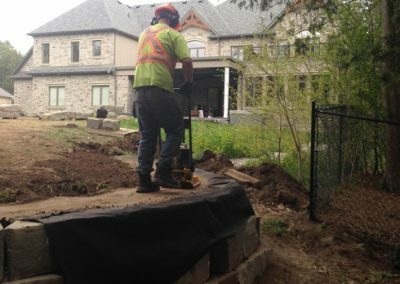 We installed new stone stairs from the driveway to the backyard and created an armour stone tiered garden alongside. 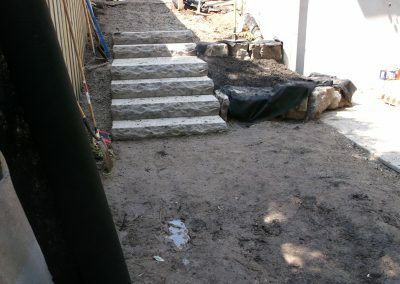 We tied the stairs into the patio with a flagstone walkway. 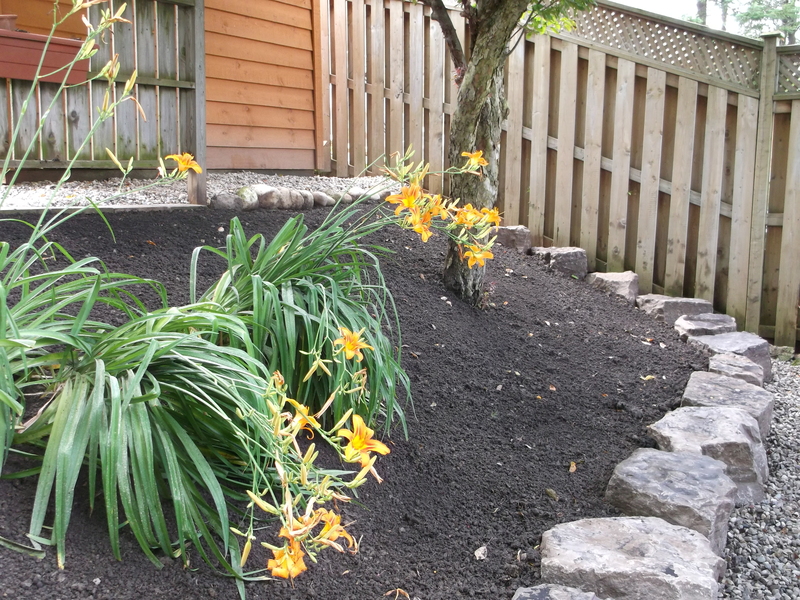 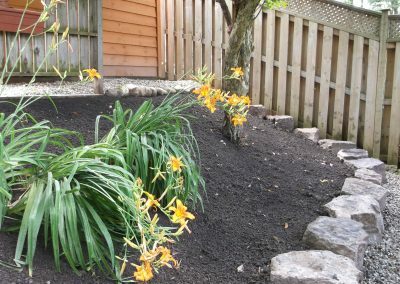 We installed black mulch to make the stone work pop, and planted tiger lilies for a bright pop of colour, and easy maintenance. 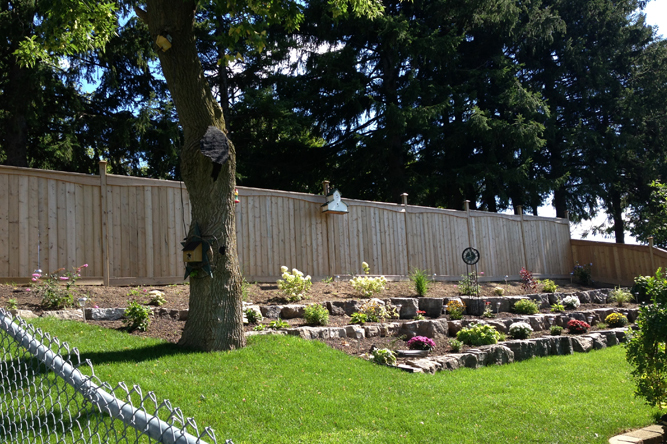 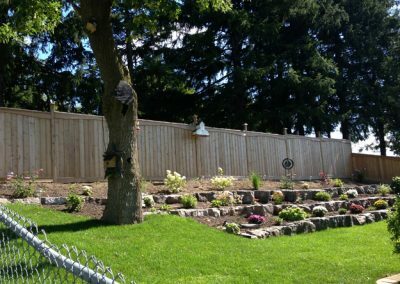 We installed a new fence and gate to ensure the client’s backyard was secure. 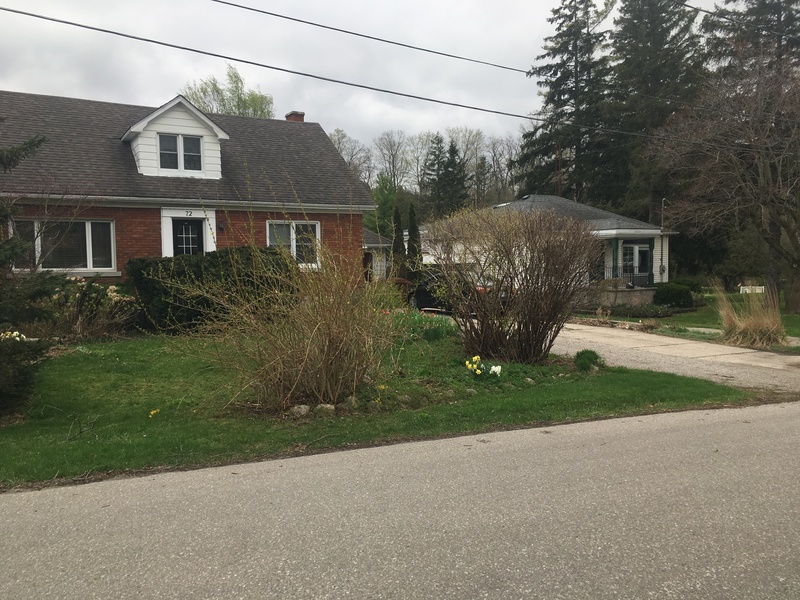 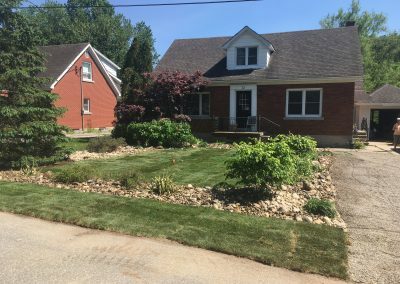 This client was looking for an updated look for their front yard, and something that would be easier to maintain. 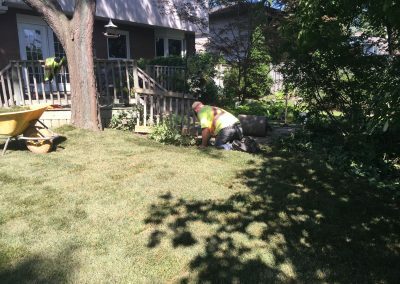 They had large, over grown bushes that needed a hard prune or to be removed. 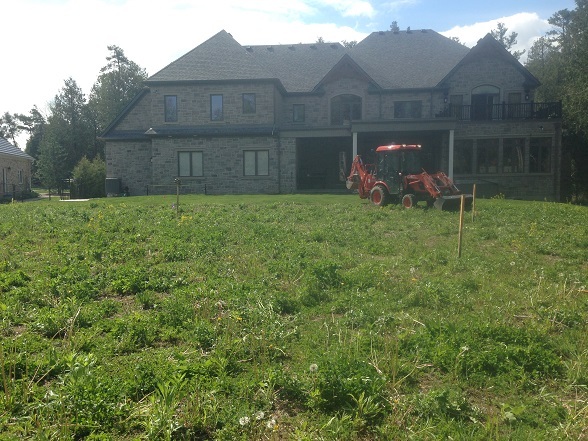 The client had a lot of mature perennials that they wanted to transplant to new locations. 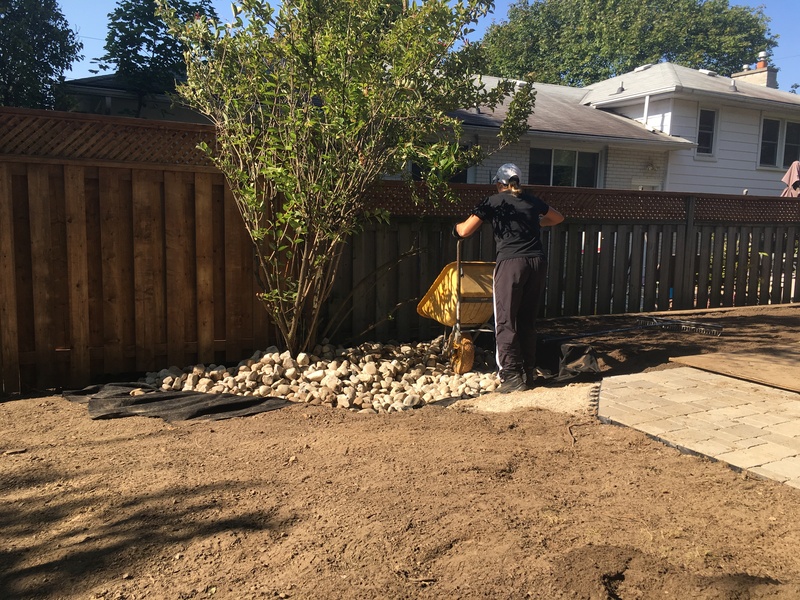 We carefully extracted all the plants the client wanted saved, planted them in pots temporarily, set them in the shade and kept them watered. 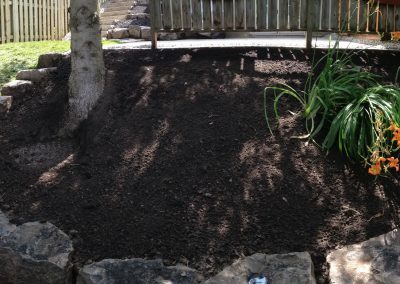 The client wanted something to cover the gardens that would not require yearly top ups like mulch does. 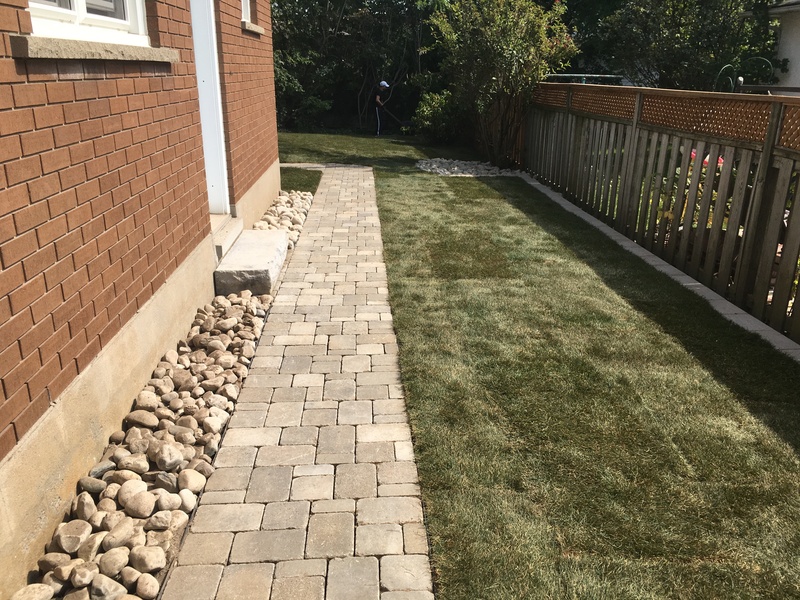 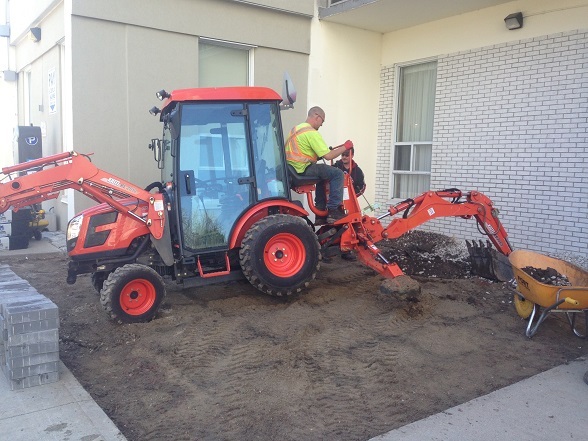 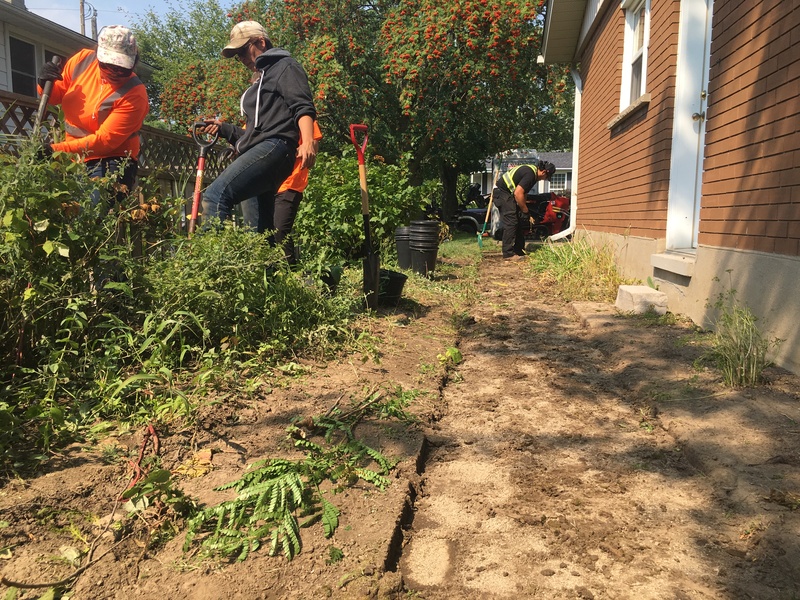 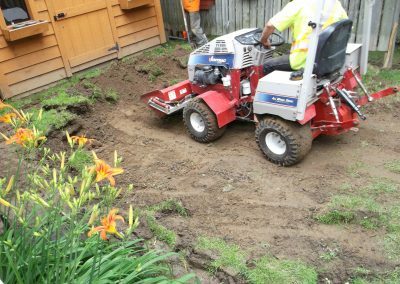 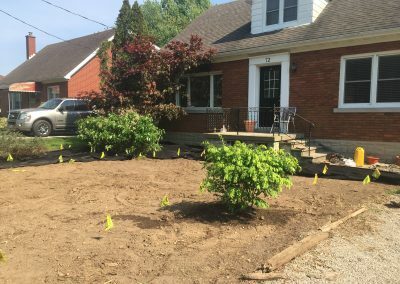 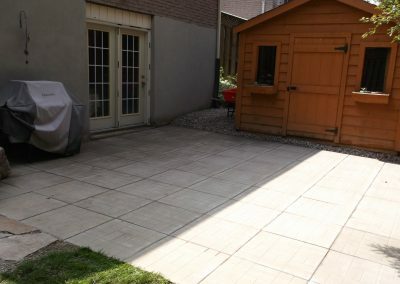 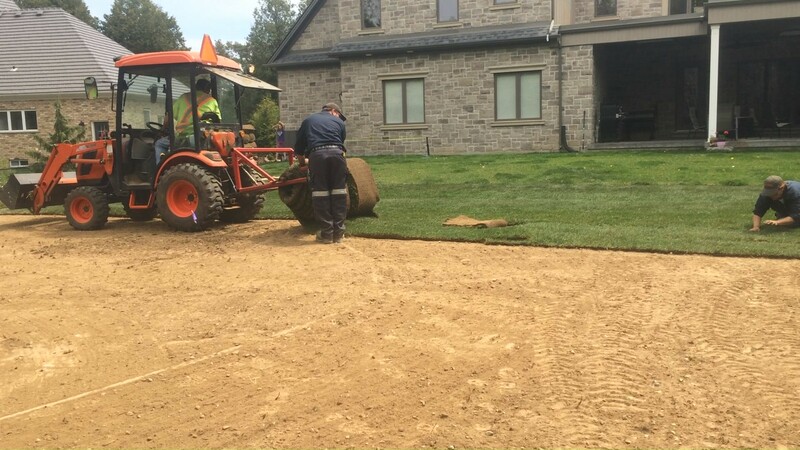 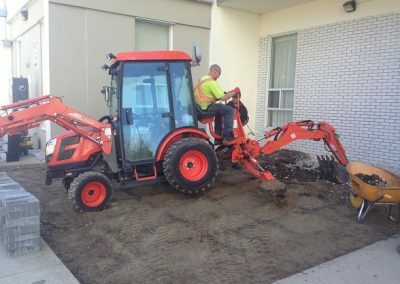 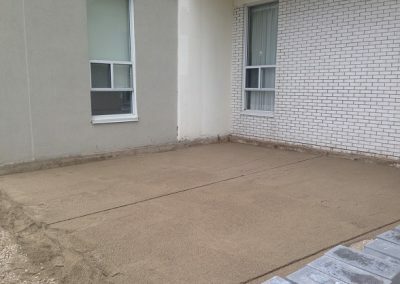 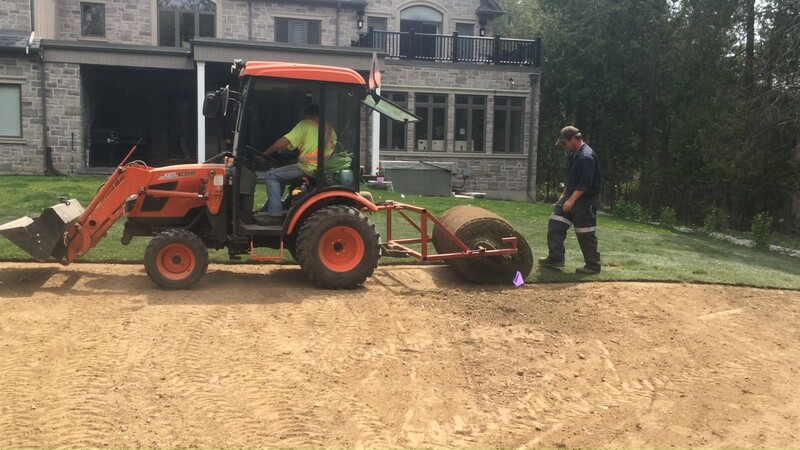 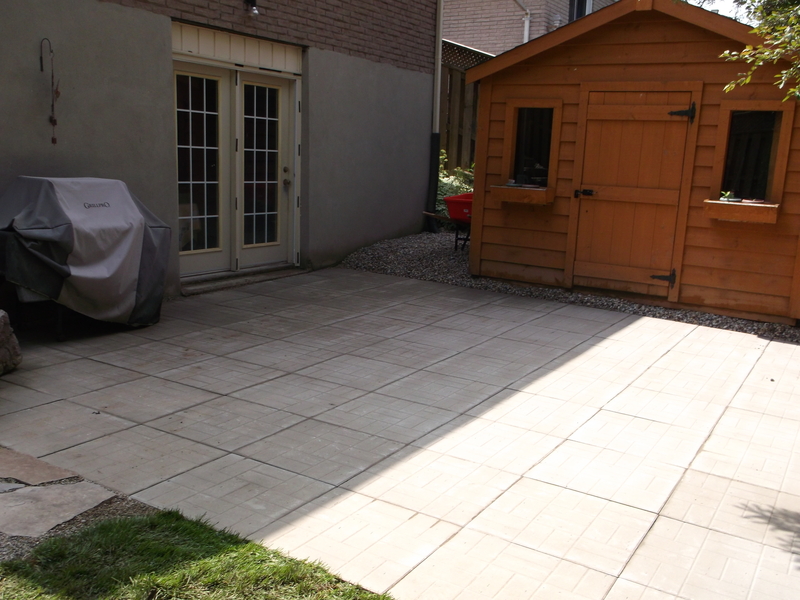 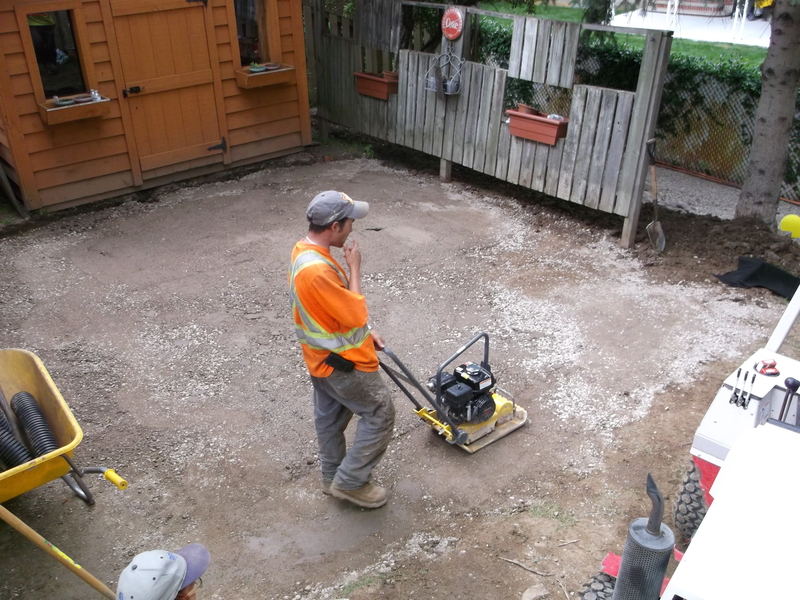 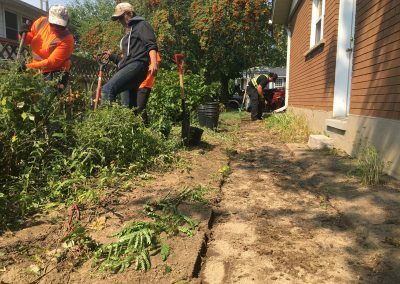 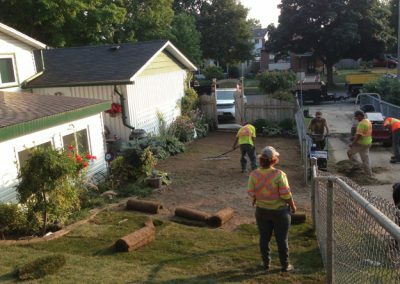 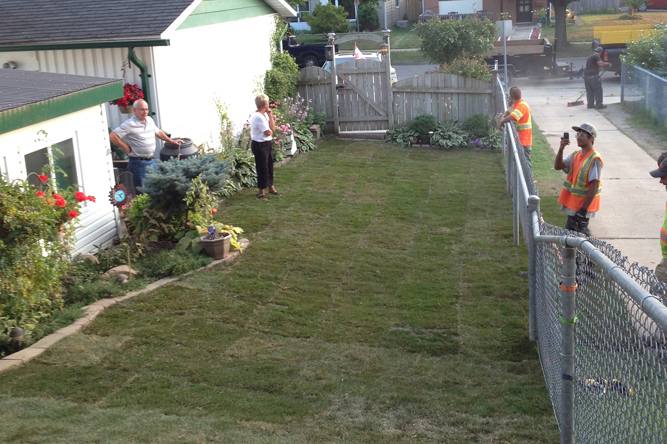 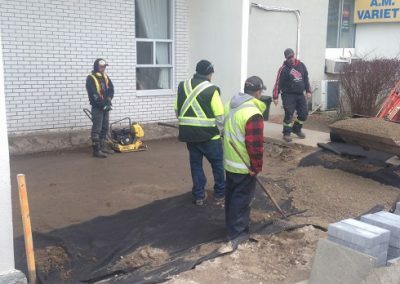 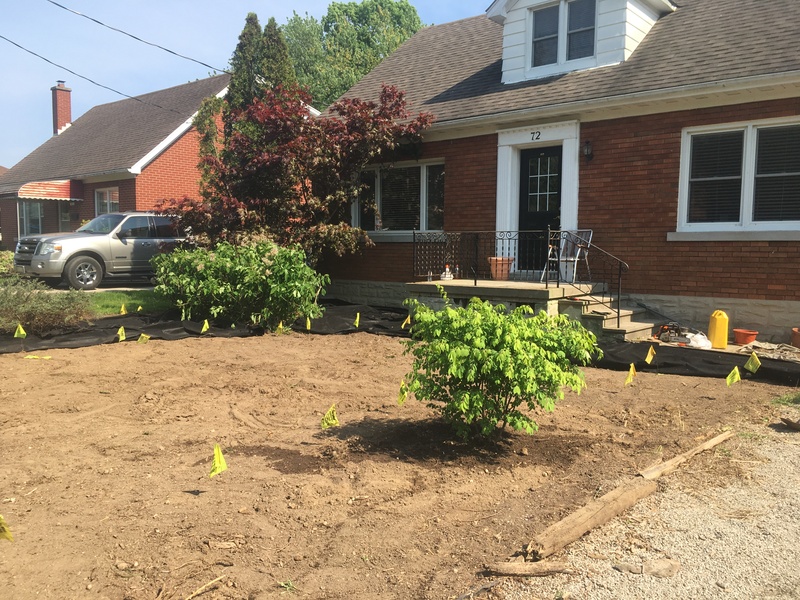 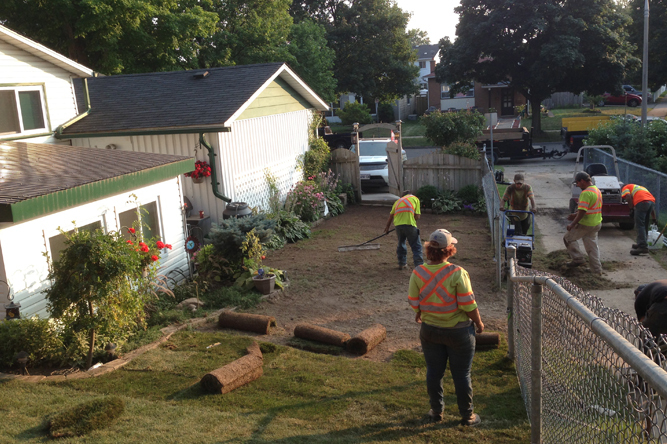 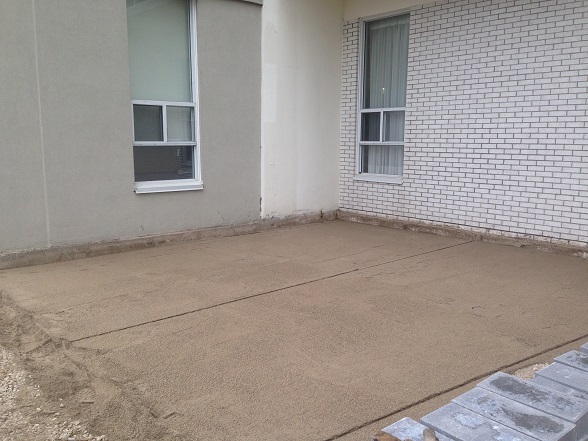 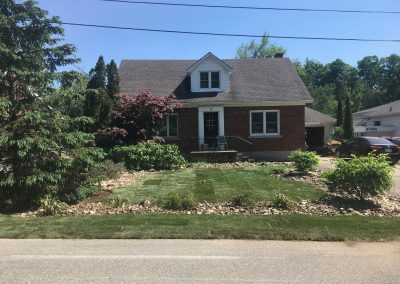 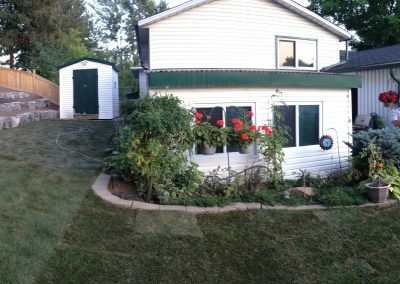 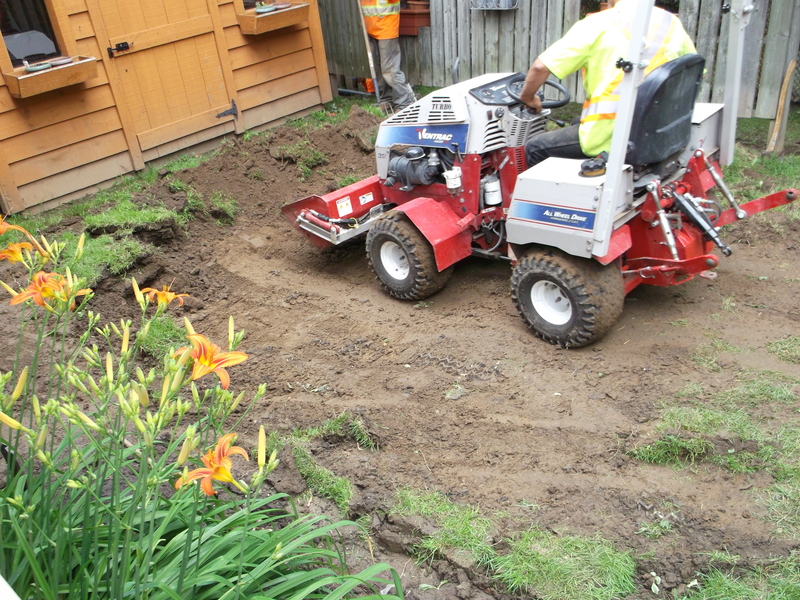 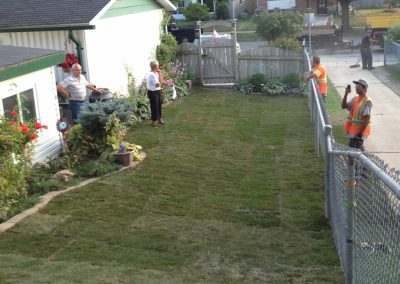 We removed all the existing turf in the front yard and levelled and regraded the area. 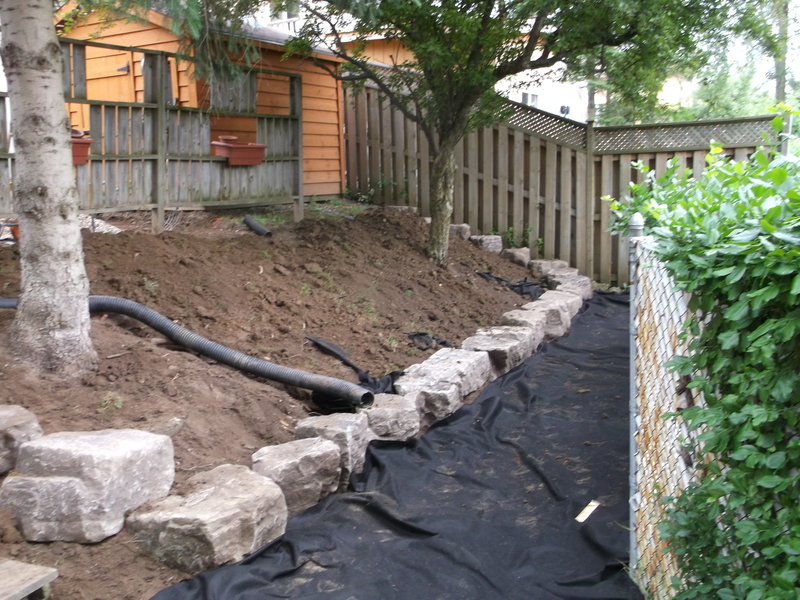 Next, we installed filter fabric to all of the gardens, and ensured our layout was how we wanted it. 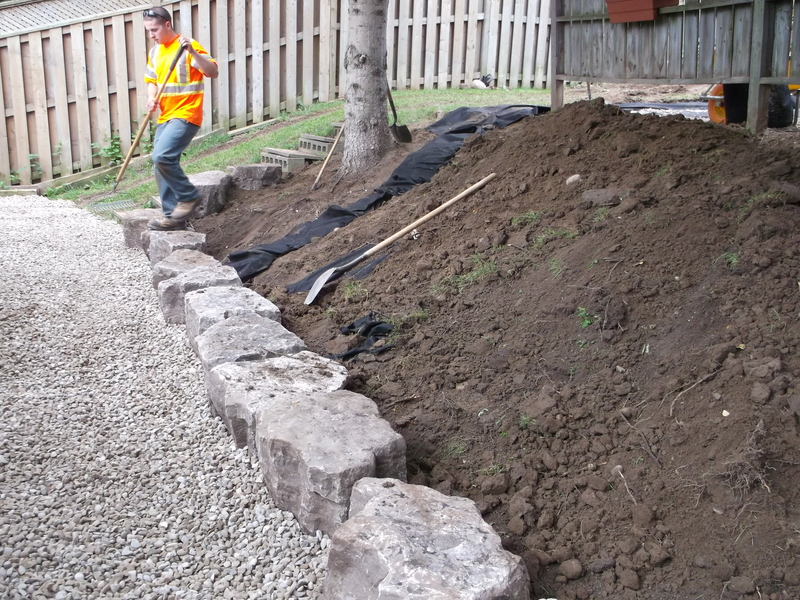 We transplanted all of the perennials from the pots into the gardens, and carefully installed river rock to the beds. The river rock worked nicely in contrast with the brick on the building and caused the colour of the plants to be more eye catching. 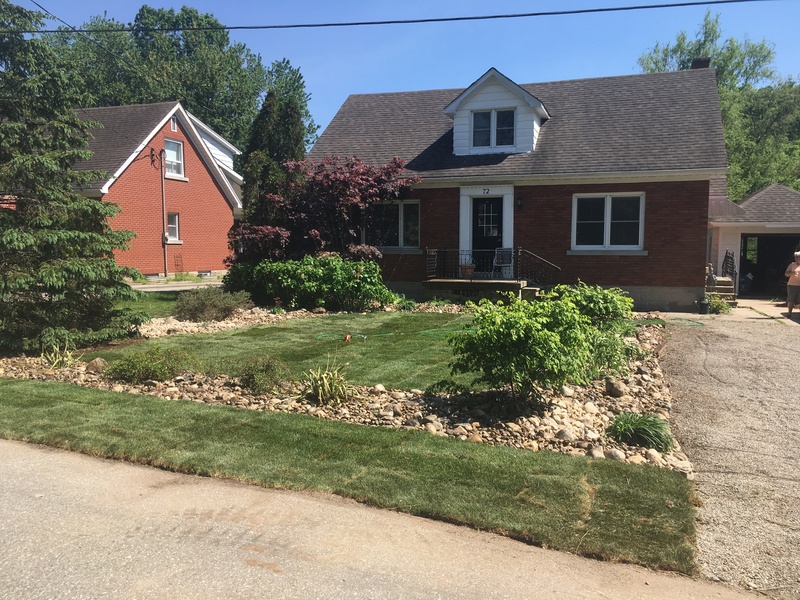 Finally, we installed new sod to all the turf areas in the front yard.